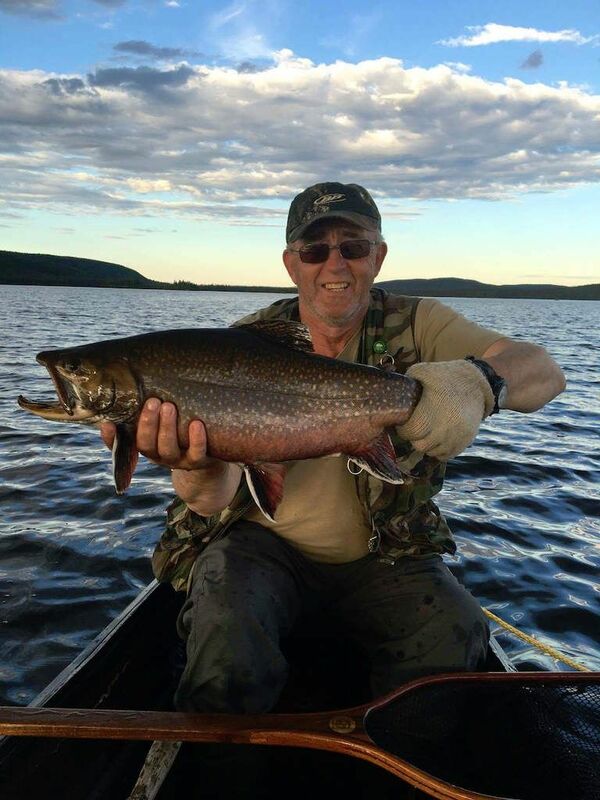 Our family has been in the outfitting business since 1973 and we have no hesitation in saying we operate an outstanding angling facility in the remote, beautiful Labrador. 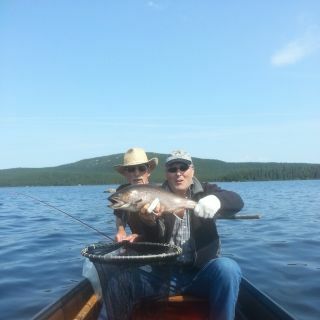 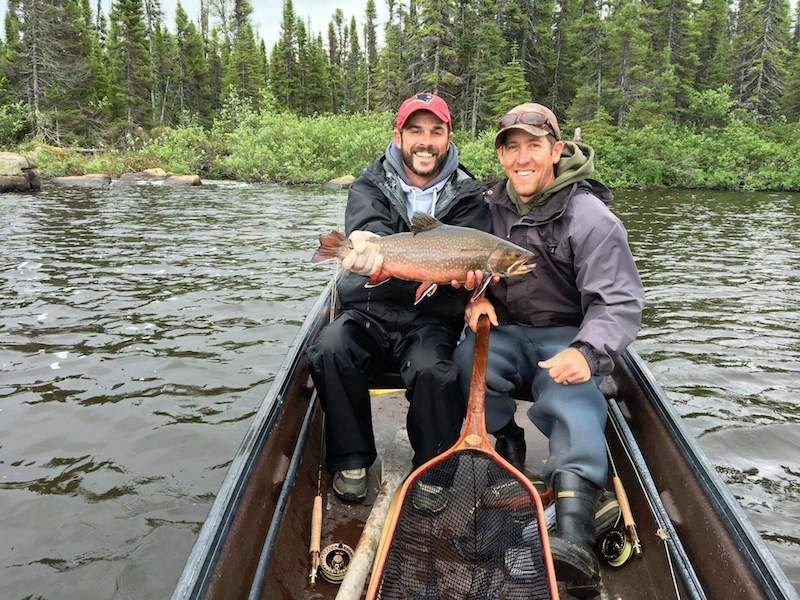 Our mission is to provide our customers with friendly professional service, great accommodations and an opportunity to experience exceptional fly fishing in remote Labrador. 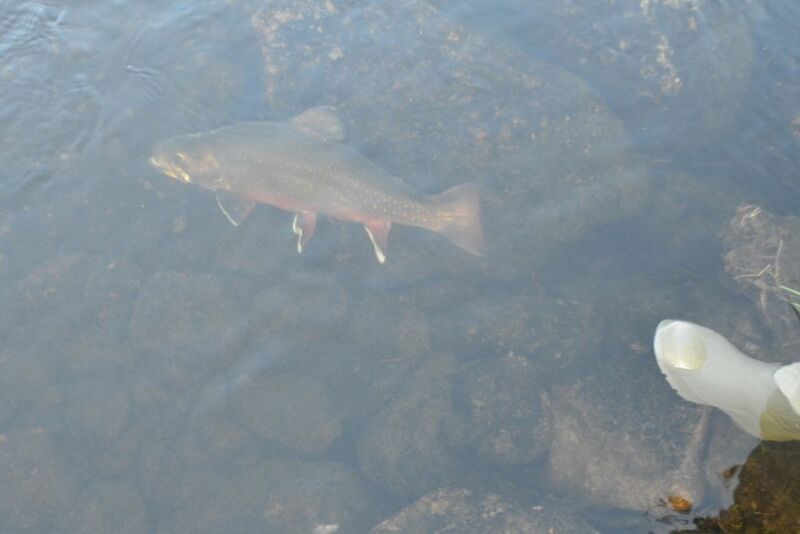 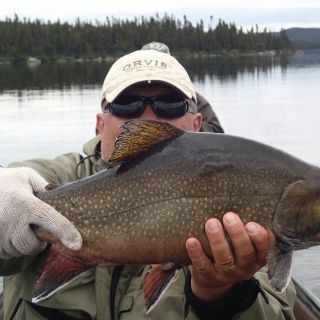 The spectacular brook trout fishing offered at Igloo is just waiting for the avid angler to cast his line. 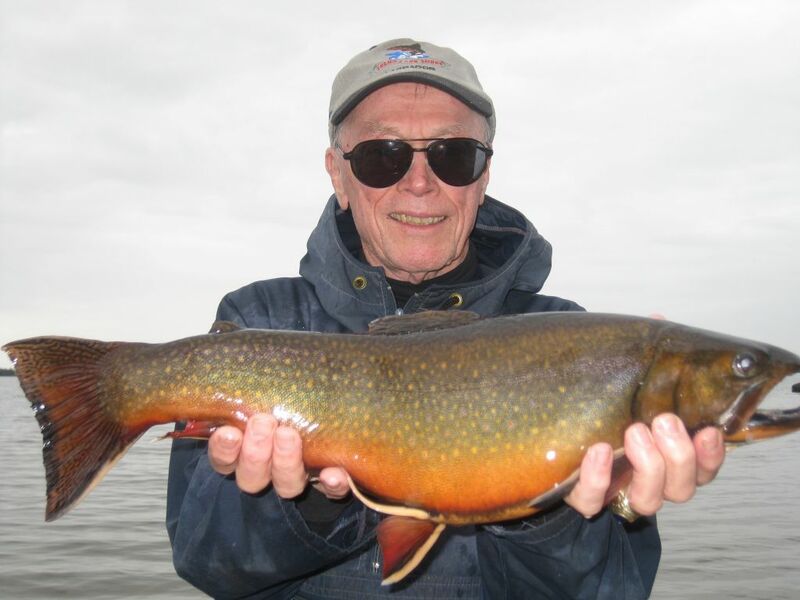 We're sure if you are an old pro or novice, you'll catch & release many brookies in the 4 to 6 pound range & perhaps some 8 pounders! 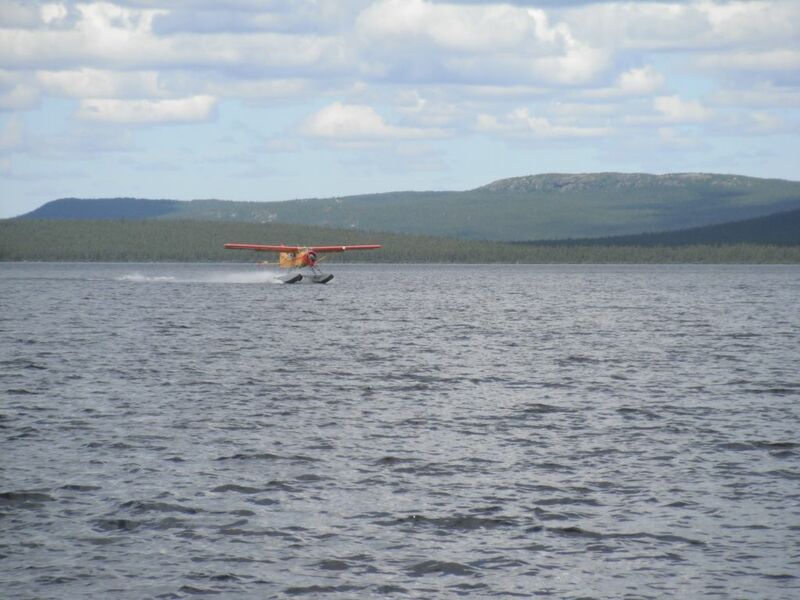 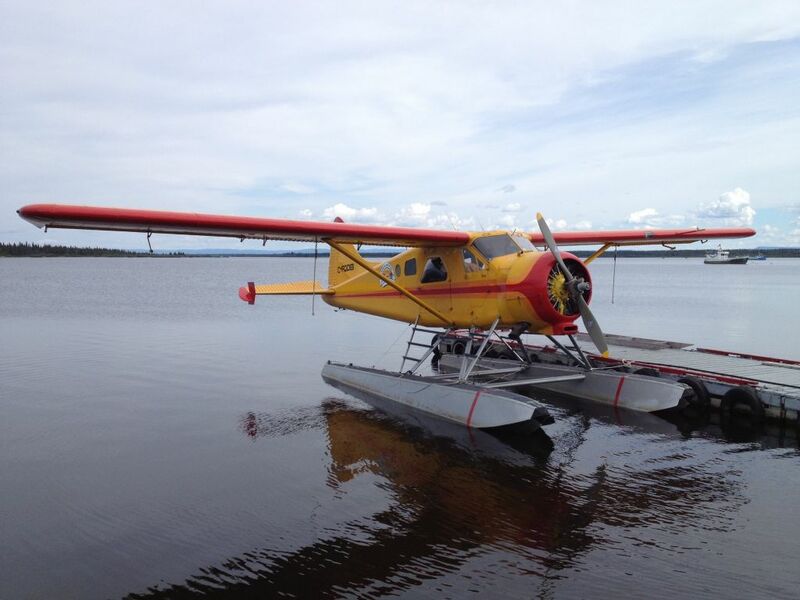 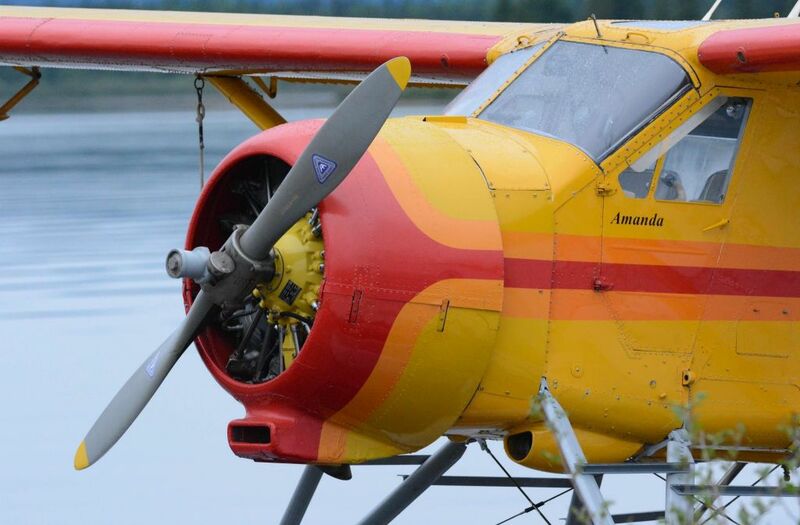 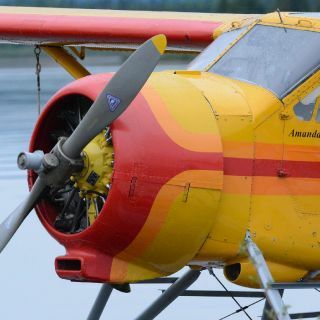 We also offer optional fly-outs for Atlantic Salmon & Arctic Char (in season) in our Beaver floatplane! 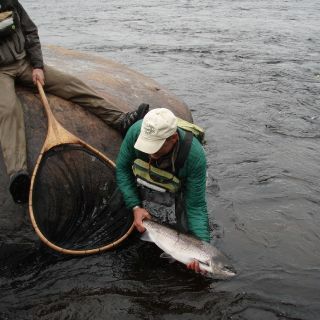 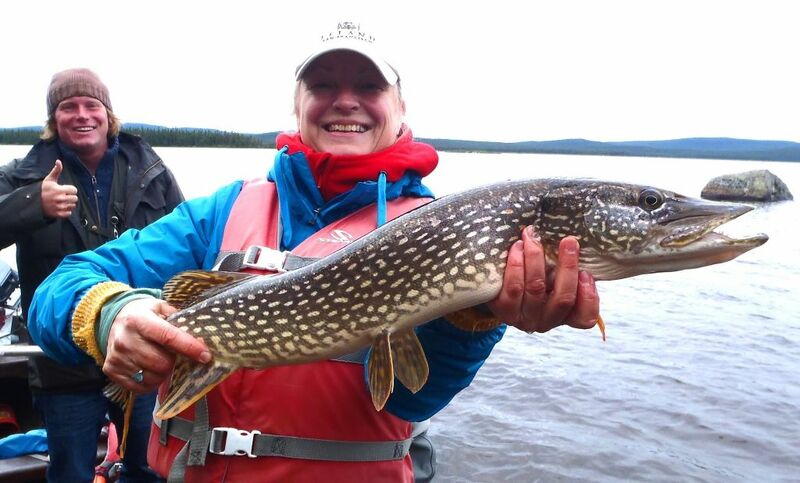 Our fly fishing expeditions at Igloo Lake Lodge are for those who wish to experience a unique angling adventure. 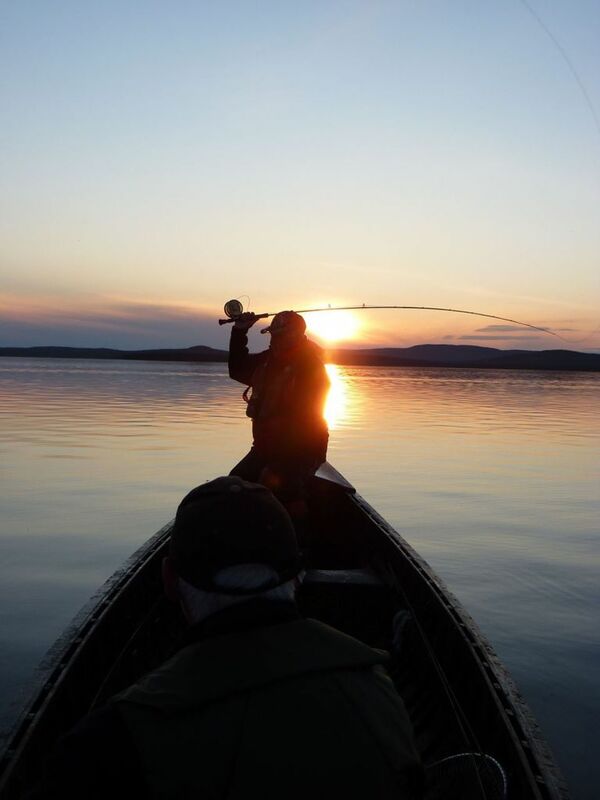 The combination of your fishing experience, our staff and facilities and the serenity and isolation of the Labrador wildness will give you something to remember long after you have returned home. 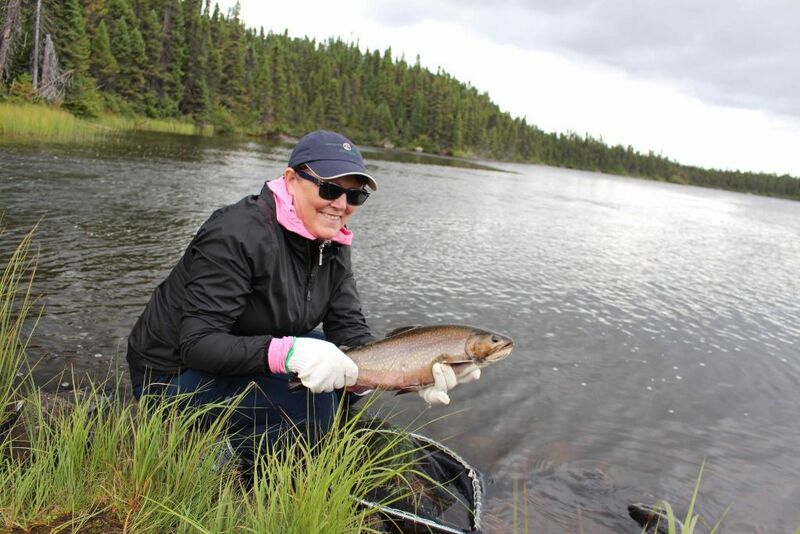 We've spent many hours fishing the pools of Igloo Lake. 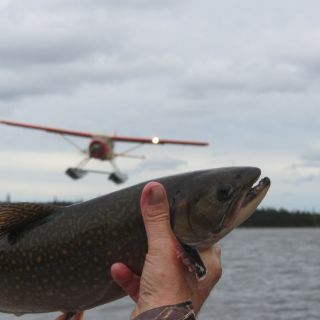 Our guests fish remote and exclusive waters accessible only by float plane or helicopter. 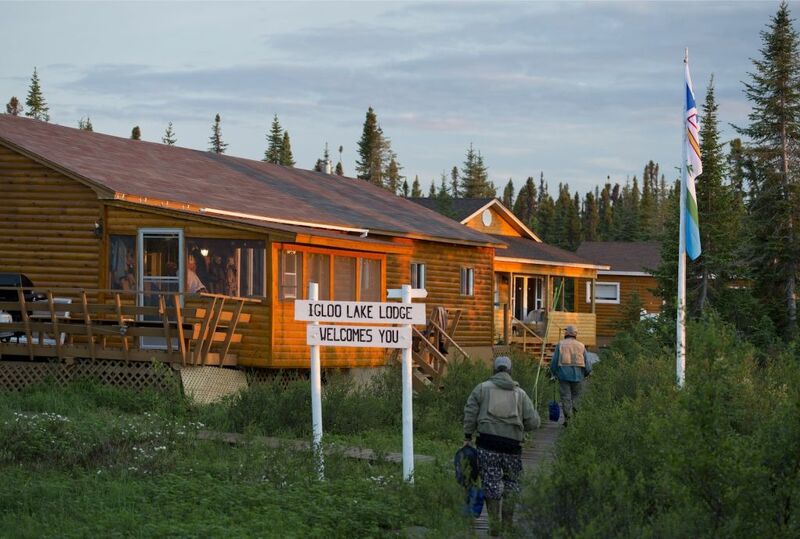 When you visit Igloo Lake Lodge, it's a wilderness "home away from home". 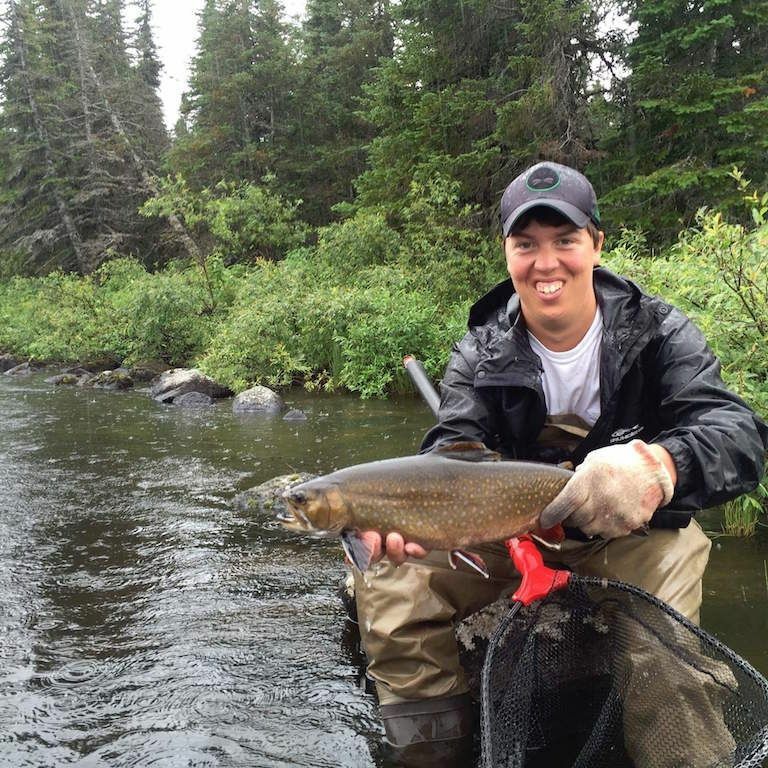 The brook trout fishing is truly spectacular! 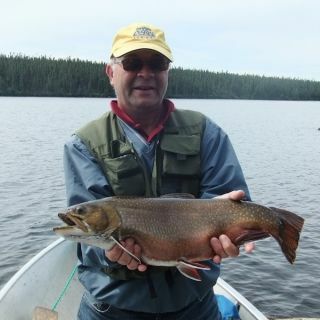 Please visit Angler Comments for previous customer comments on our popular Igloo Lake Lodge. 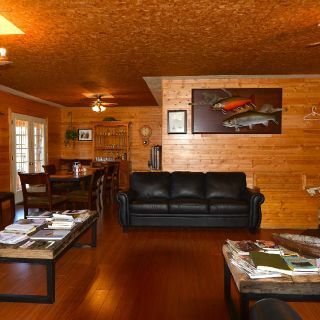 Our lodge has many comforts of home, away from home. 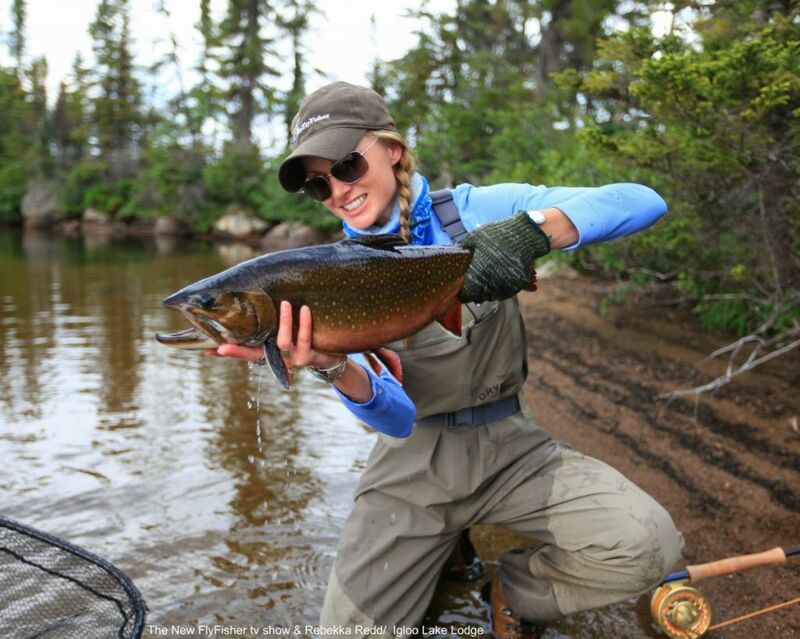 The main lodge has most amenities to offer comfort for our guests. 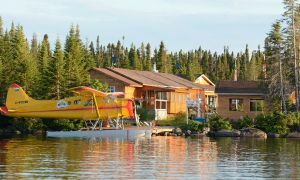 It contains 1700 sq. 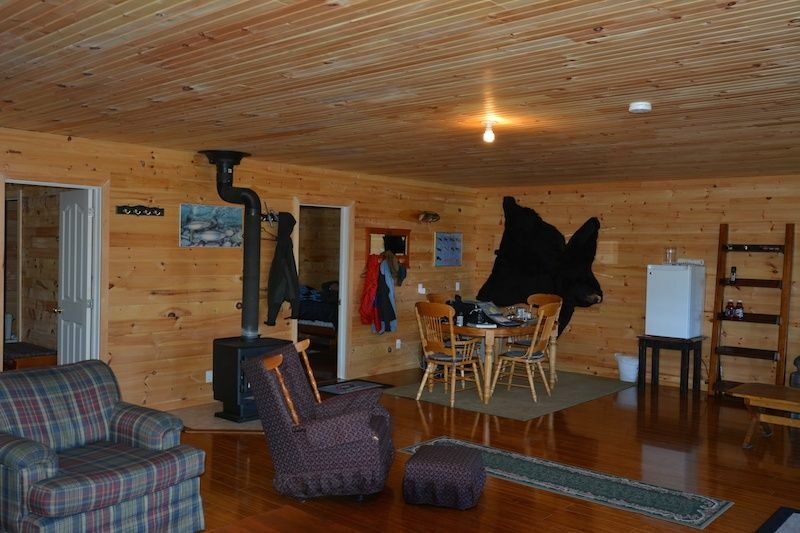 ft. of floor space with 5 twin bedrooms and two full bathrooms, accommodating 10 people. 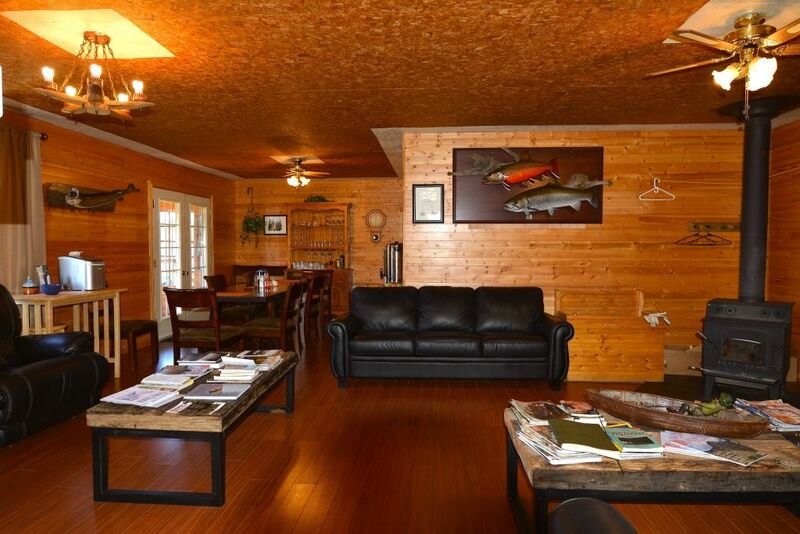 Our new Labrador Room has approximately 800 sq. 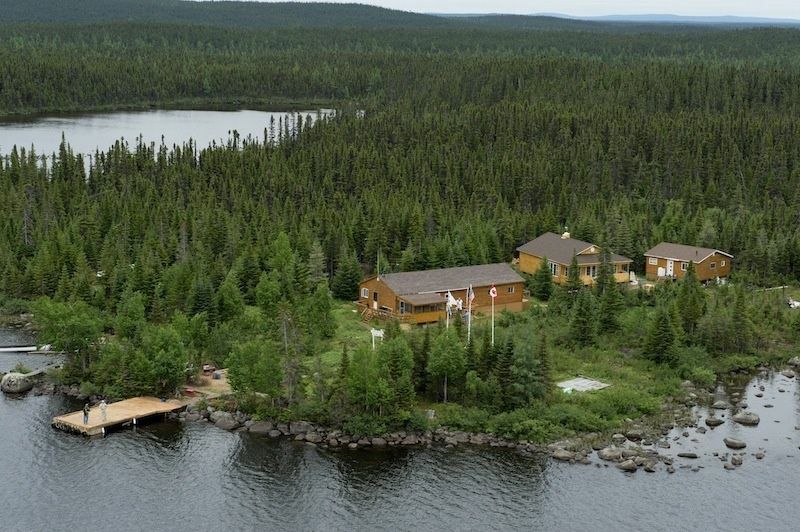 ft. of space consisting of two large bedrooms with full ensuites, a large living room, small kitchenette, fly fishing library and a covered veranda offering a sweeping view of the gorgeous Igloo Lake. 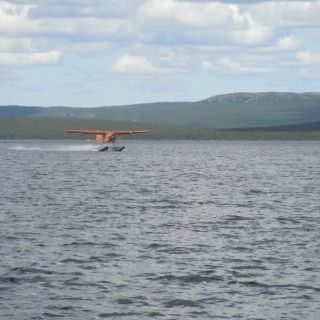 At Igloo Lake Lodge, we are a catch & release facility (since 2002) & feel proud being good stewards of the resource & the environment as we offer paperless transactions, fly all the garbage & recyclables out to Goose Bay via floatplane, we also encourage folks to reuse towels, we even have several bat View more...houses placed strategically around the facility to help add to the life & success of these little critters as they help control the insect population. 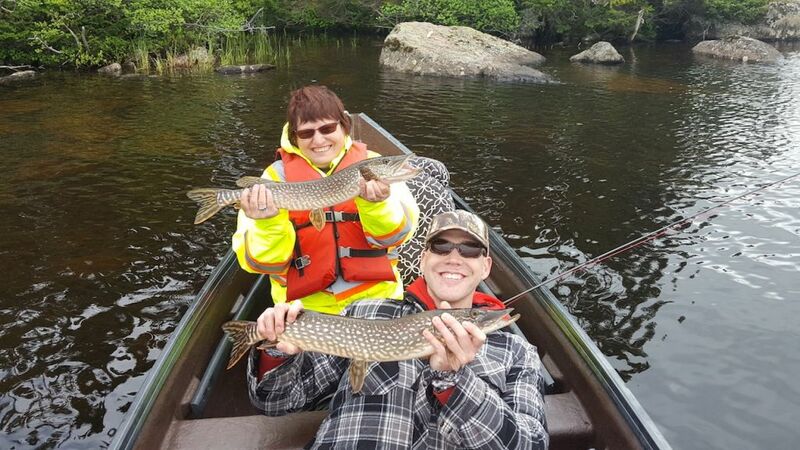 Our staff are our most important resource. 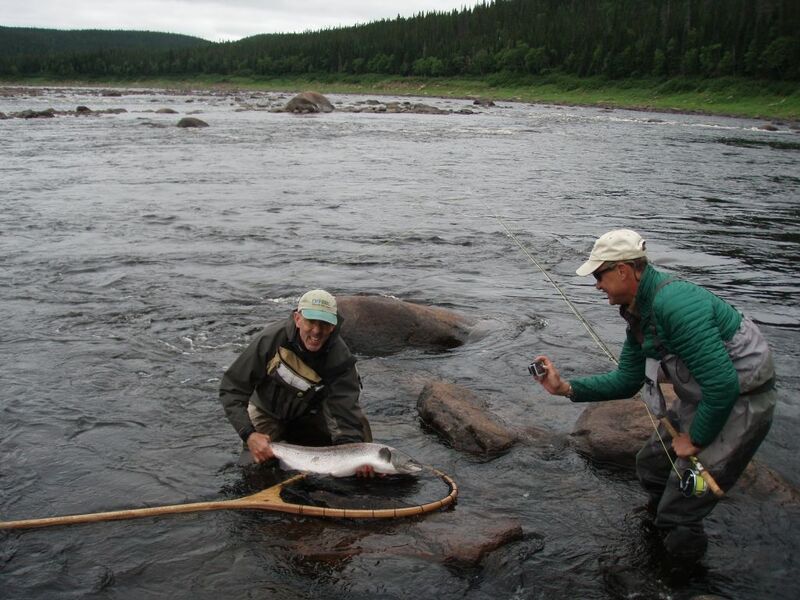 We have well experienced, very knowledgeable & friendly guides who have been employed with us for years. 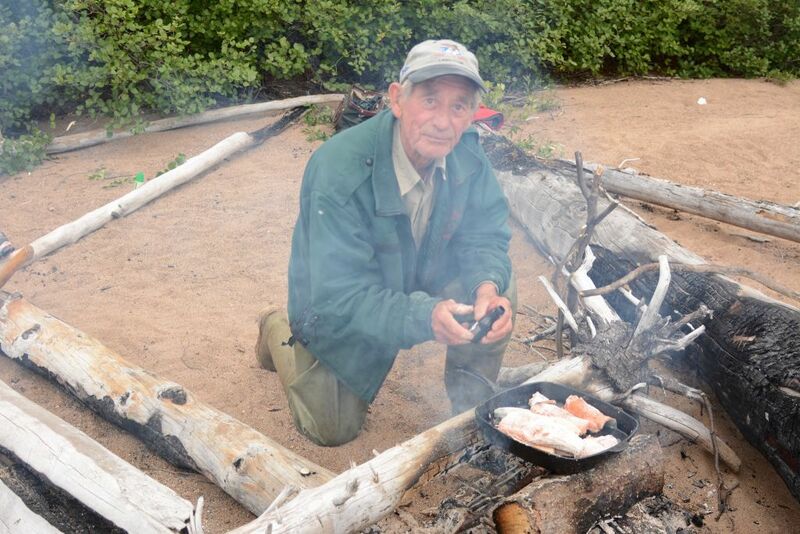 Our Chef provides hearty meals. 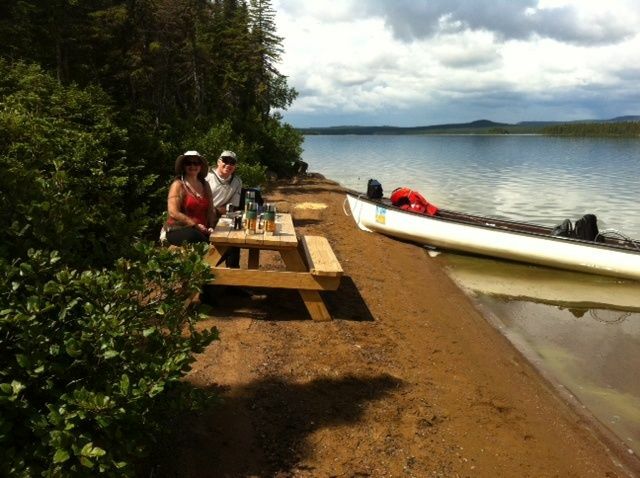 Second only to our guides service are our meals but many have said vice versa. 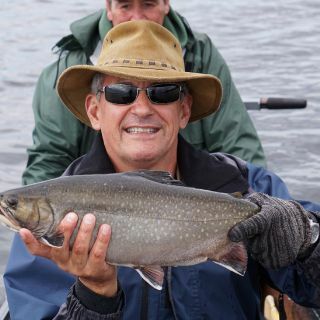 It truly is an unforgettable experience to have spent some time and share the friendship with our highly skilled guides who are dedicated to our guests and constantly go out of their way for your comfort and safety. 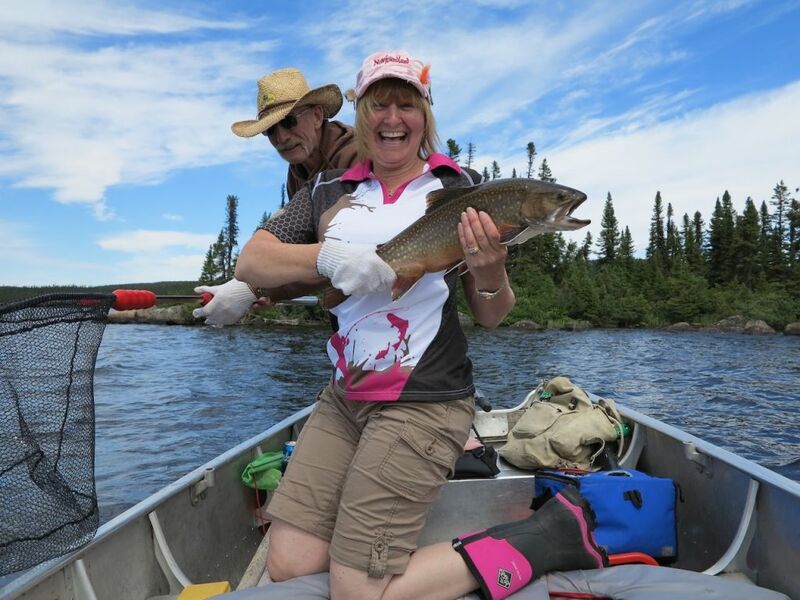 I have to say that our trip to Igloo lake in July of 2015 was one of the most relaxing and exciting trips that my husband and I have ever taken. 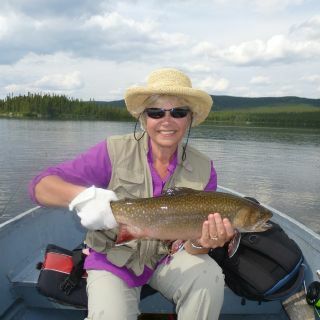 While my husband, Ernie Squires, is an avid fly fisherman, I had little experience with this form of fishing. 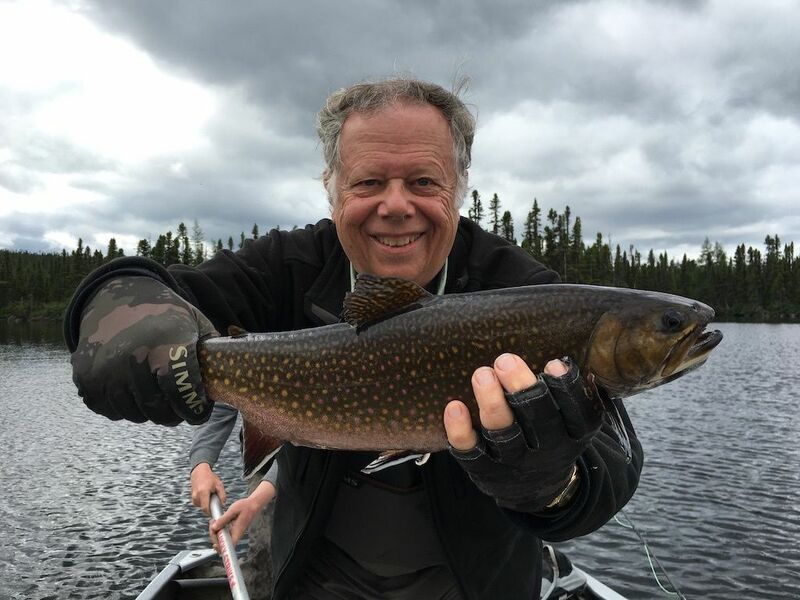 With the help of an exceptional patient guide (who knew when to give me advice and when to let me do my own thing), I was able to catch the biggest brook trout and Northern Pike that I have ever caught in my life. 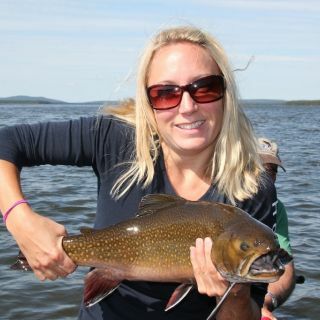 Even though my cast was not as far as others, it did not limit what I was capable of catching! 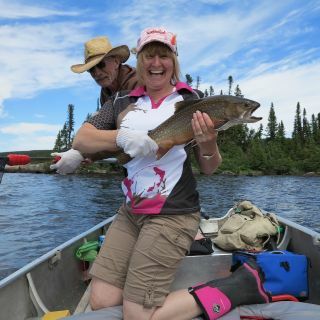 My novice skills with this sport were fully supported by my guide, leaving my husband the freedom to fully enjoy his experience as well! 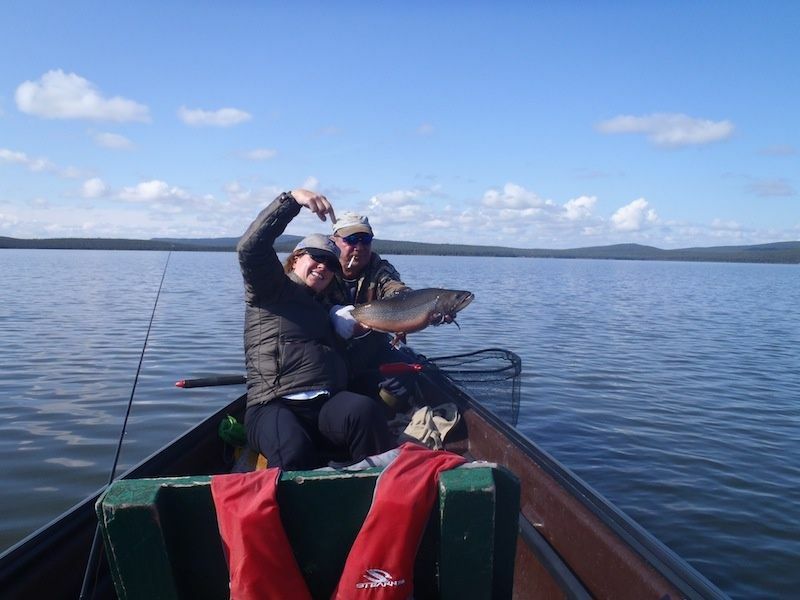 Our accommodations were exceptional, as was the service of all the staff. 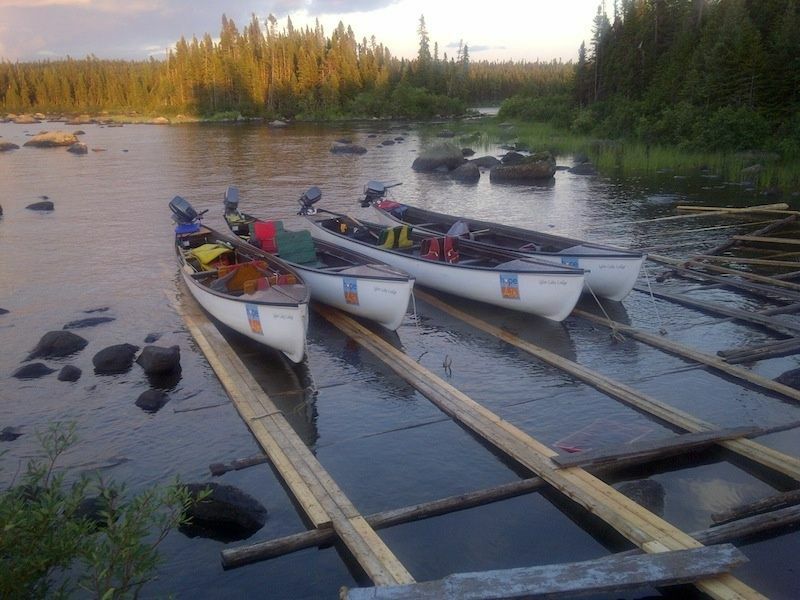 We had a comfortable bed, shower and washroom facilities and many common area spaces to share with other guests. 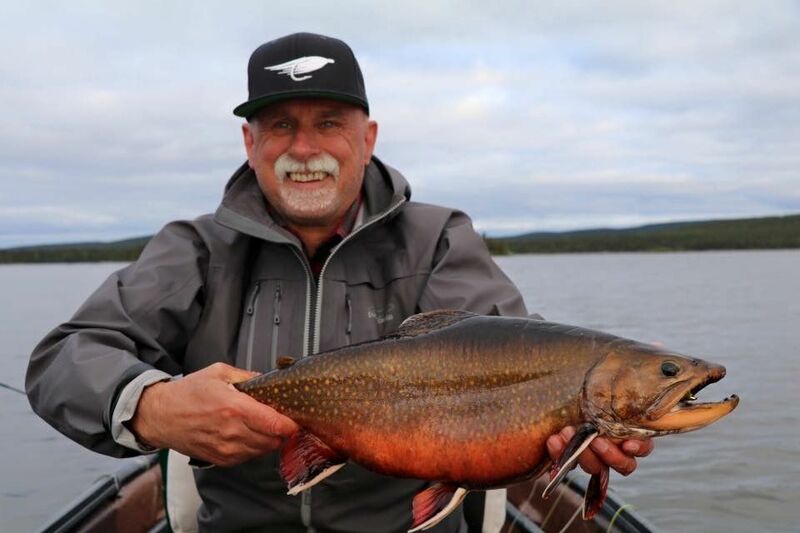 Our dining room was welcoming with exceptional food and the opportunity to socialize with other guests to share our day's fishing tales. 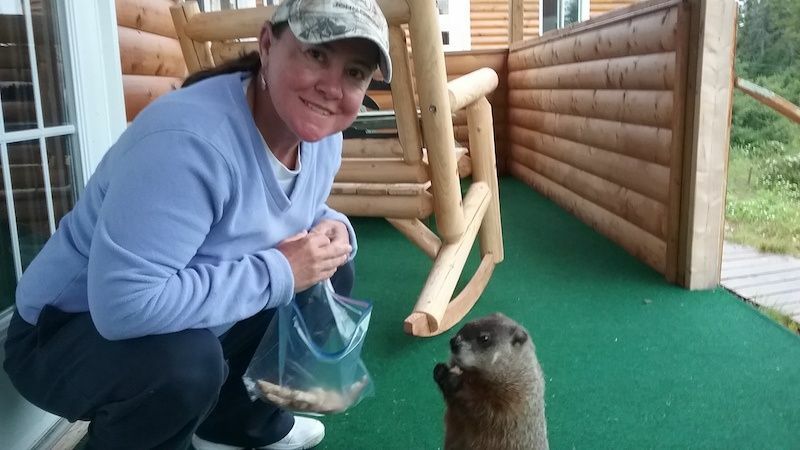 To be able to order a packed lunch of your choice for day trips and pick it up on your way out each day was also a treat! 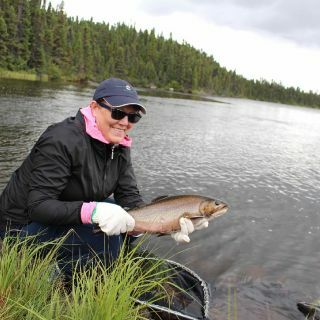 One of my most memorable experiences was our day trip to Eagle River. 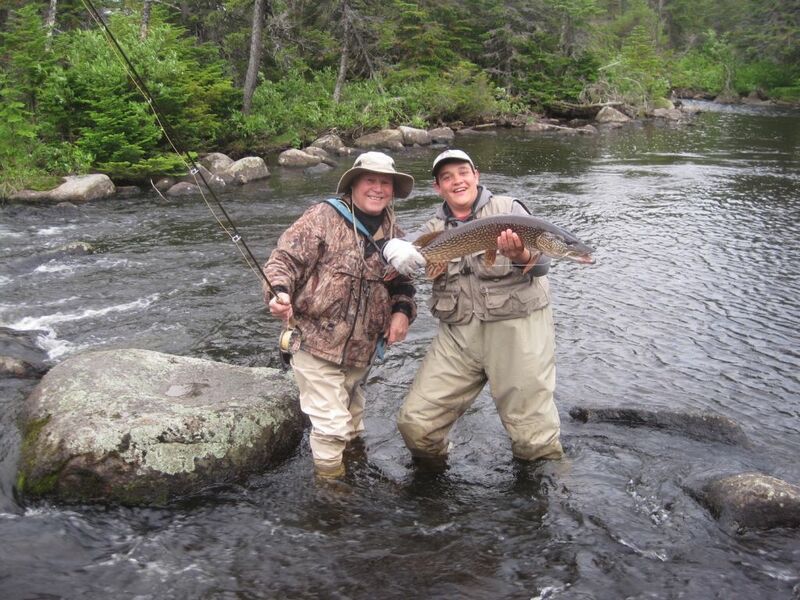 We flew out for the day for our private salmon fishing experience at Owl Brook. 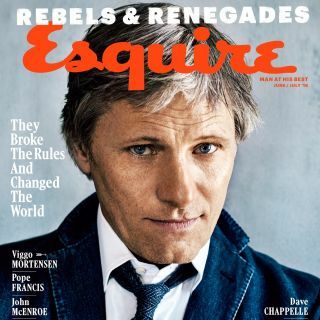 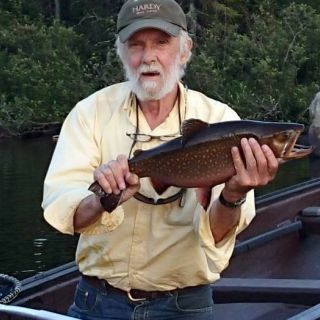 I recall my father, the late Ray Simmons, talking about camping close to a salmon river, to get the best spot for fishing before others would arrive. 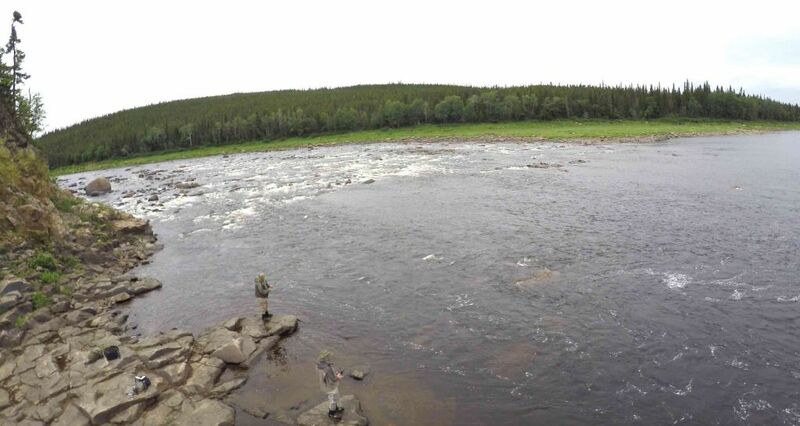 To arrive at this magnificent brook and have our choice of casting locations was a treat that any salmon fisherman would appreciate. 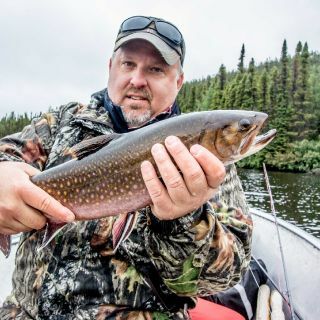 Despite being a bit early for salmon that year and only catching a few large brook trout that day, the time on the river combined with the flight down Eagle River between the treed shoreline at the end of our day was a flight that I will never forget. 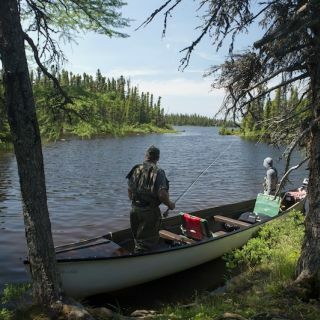 I would strongly recommend Igloo Lake to anyone who needs a break from their busy lifestyle; wants to experience a fantastic fishing adventure; and would like to experience being in the wilderness in comfort with true relaxation available! 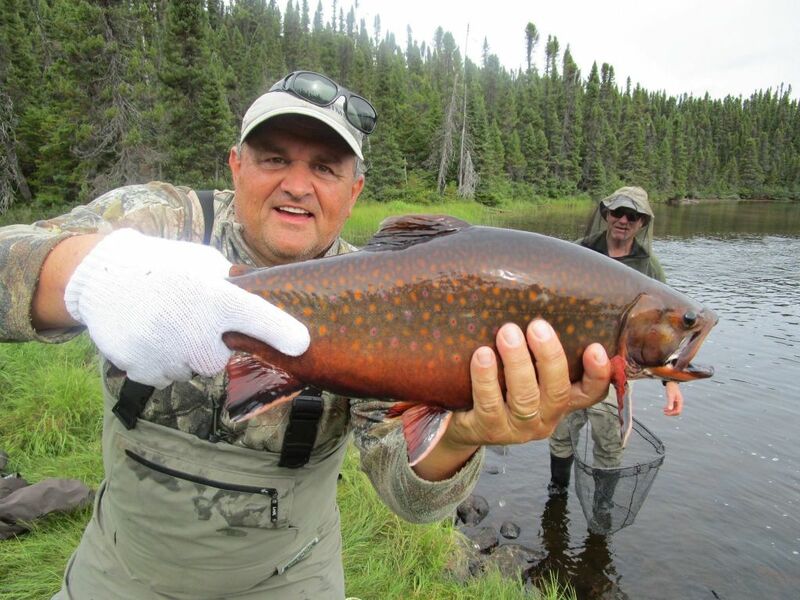 Fishing trip of a lifetime with huge brookies and lots of them! 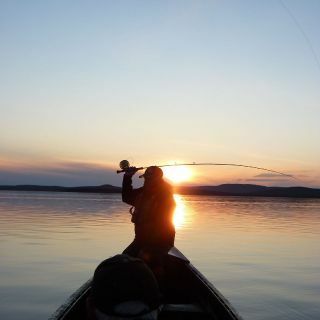 One late afternoon my guide and I had over 3 hours of the best fishing I've ever experienced. 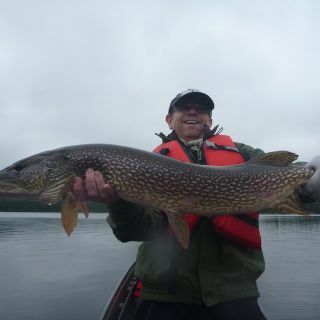 I lost count after 25 - all in the 4-5lb range and all going for large bombers. 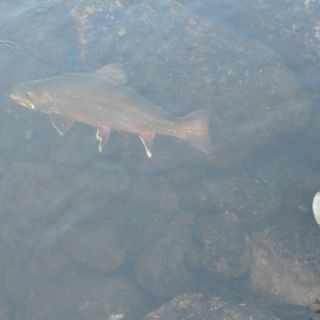 Watching 3 & 4 fish coming for the fly at the same time is etched in my mind! 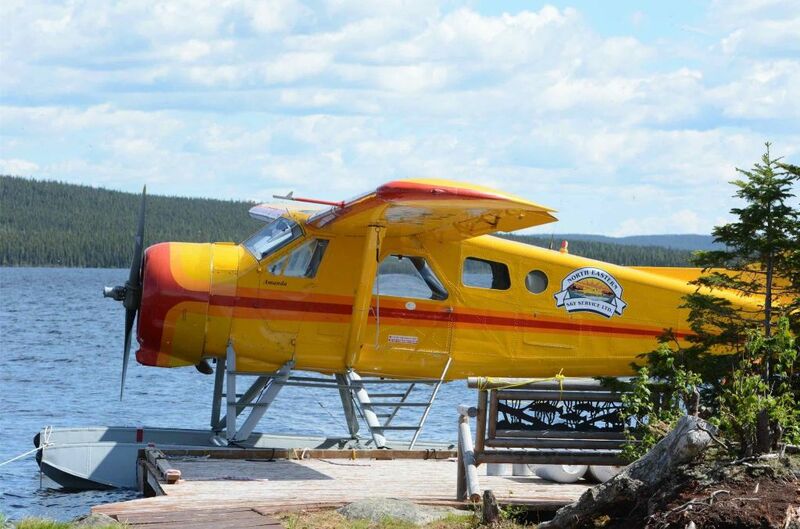 Combine the great fishing with superb accommodations, an amazing cook, great guides and one of the best bush pilots to ever fly a Beaver, it's definitely a trip to add to your bucket list. 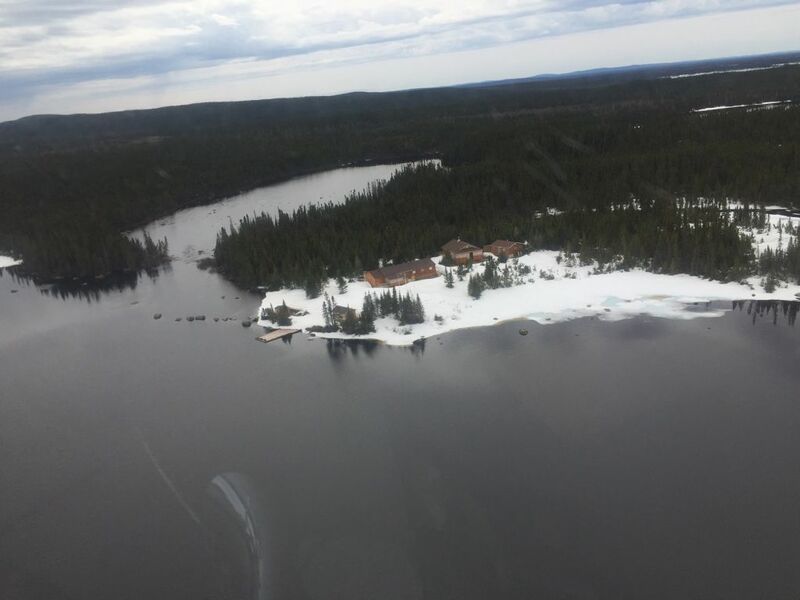 I'm looking forward to Igloo Lake 2017! 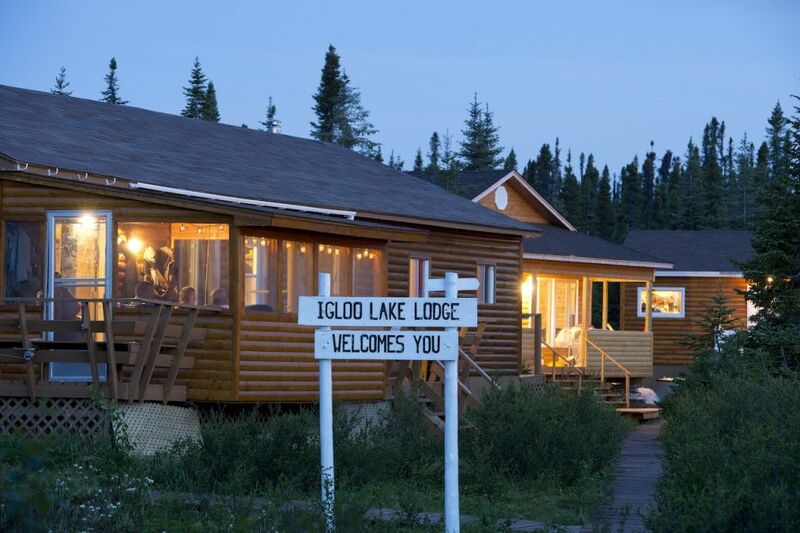 Simply put, book a trip to Igloo Lake Lodge. 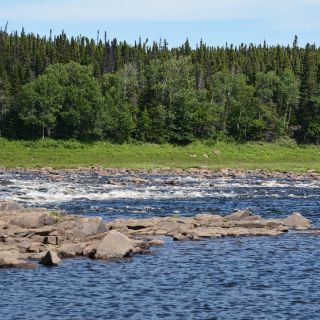 It is a special place that all people should have the opportunity to experience. 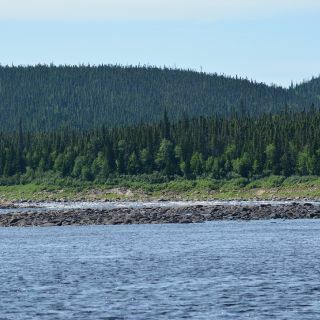 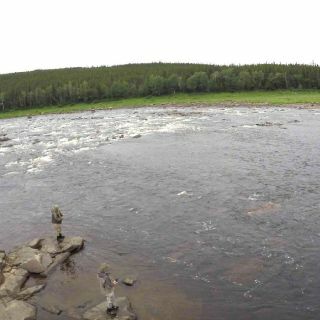 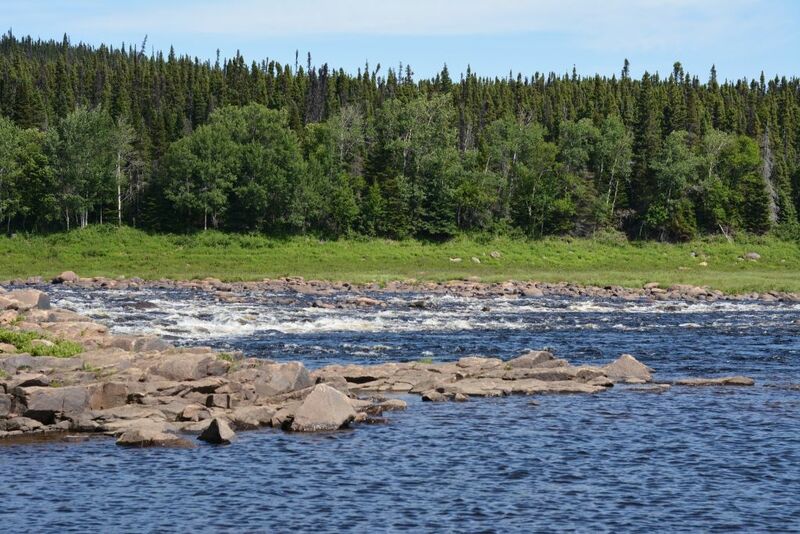 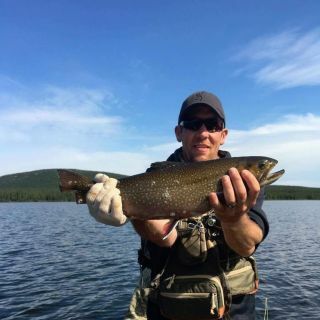 Whether you are just starting out or you are an experienced angler, this place will redefine your perspective of both fishing and of the beauty of Labrador. 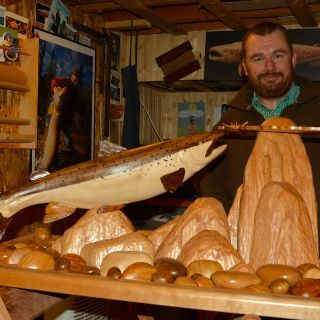 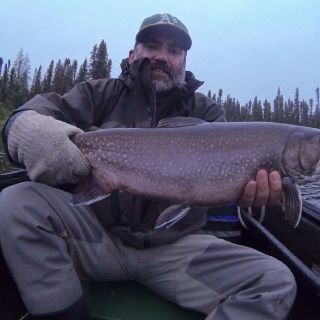 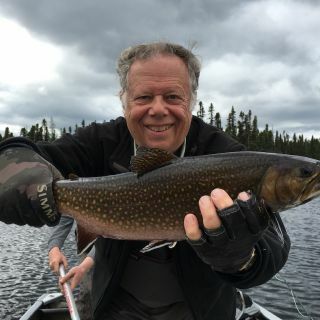 As a young boy fishing small rivers for brook trout in Newfoundland, I could have never dreamed of being given the opportunity to fish for monster brook trout and huge pike at Igloo Lake Lodge. 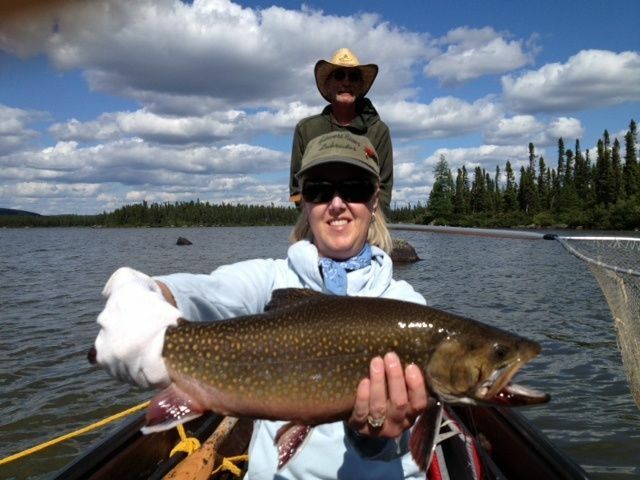 The accommodations, staff, guides, food and fishing are all top notch. 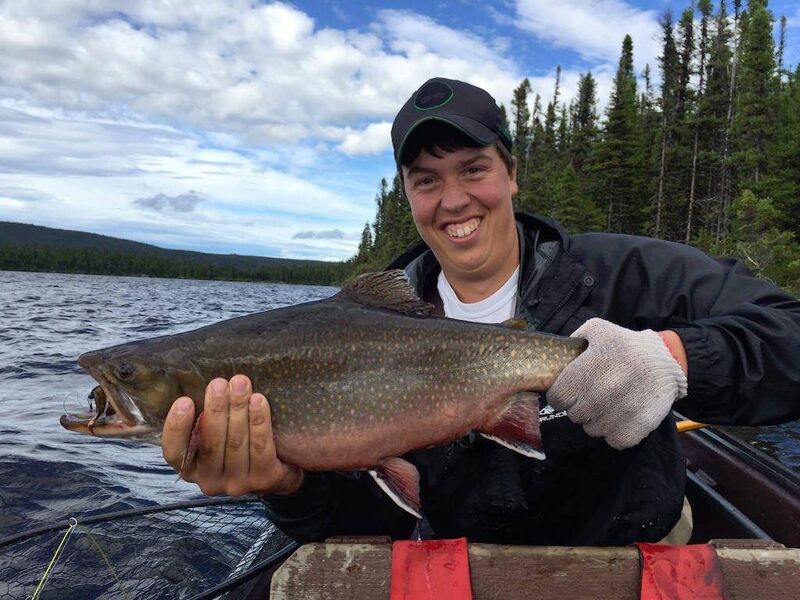 On top of all of this, I was able to share the experience of visiting Igloo Lake Lodge twice with my son. 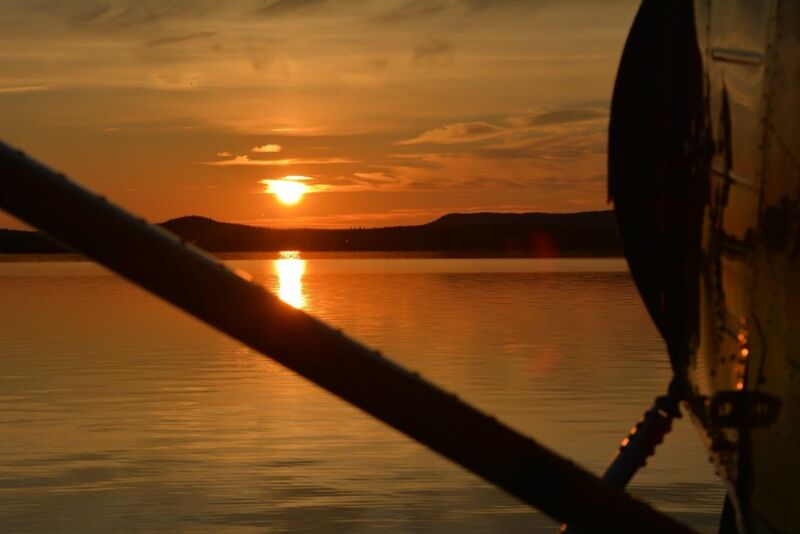 The memories we created are truly priceless. 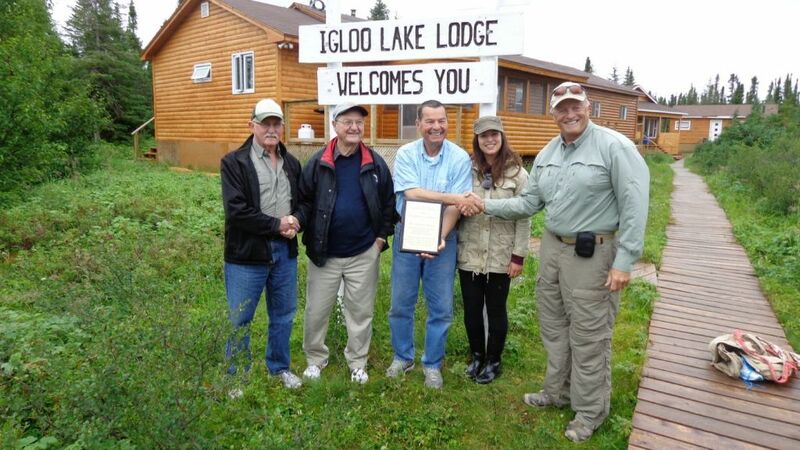 I have had the great pleasure of visiting Igloo Lake on two occasions. 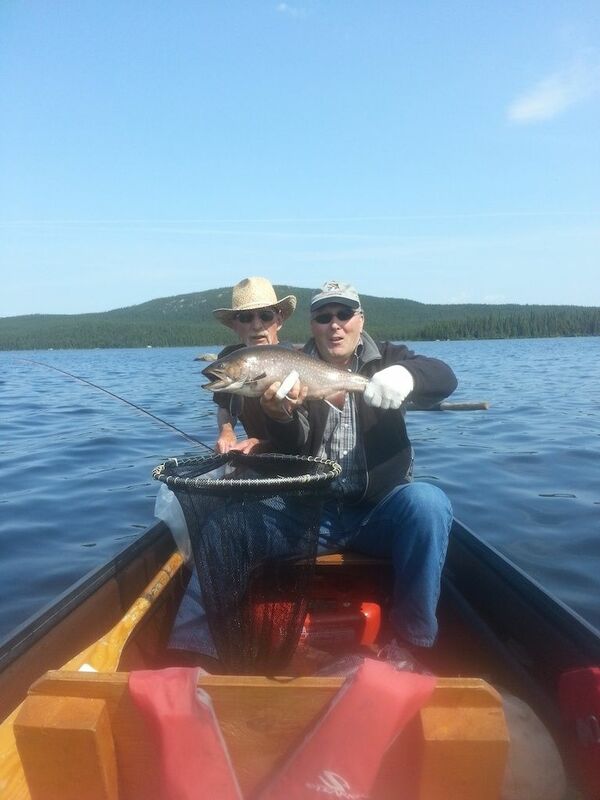 The service has been first class from start to finish. 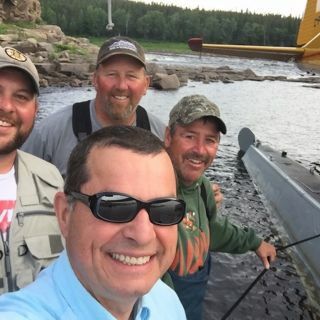 Jim and his staff make you feel part of a big family. 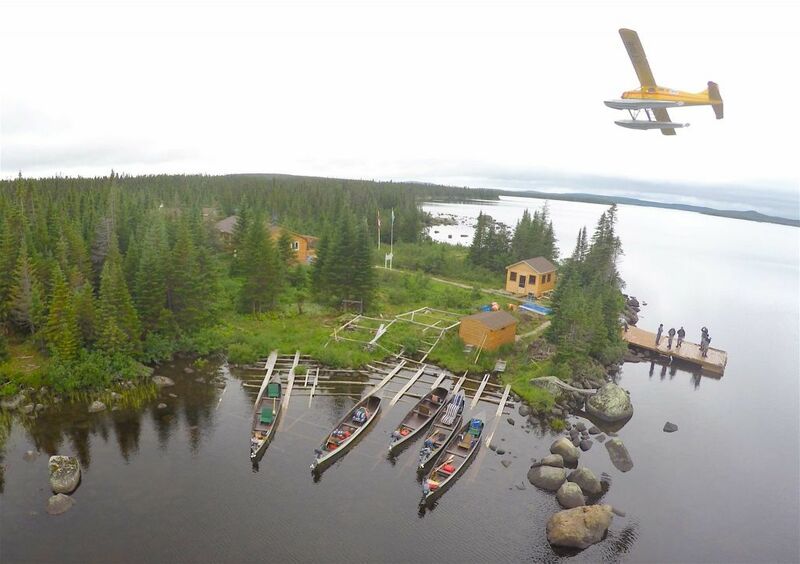 The rustic lodge matches the wonderful Labrador experience. 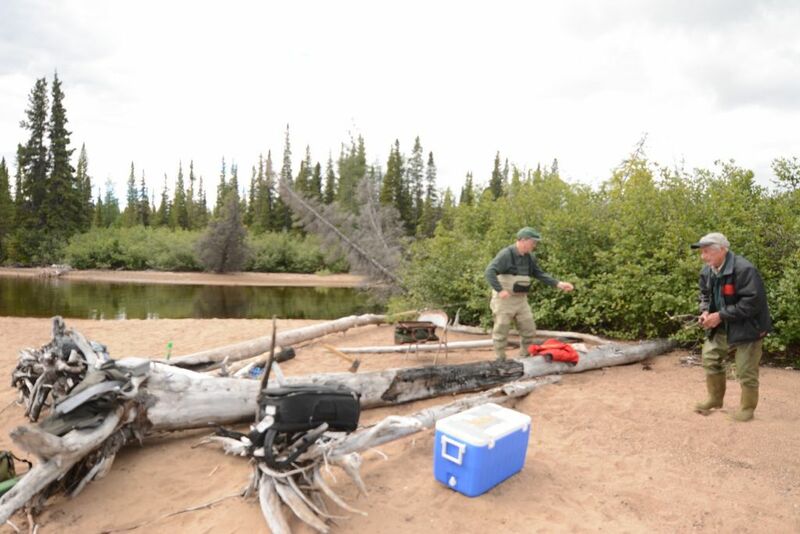 A hearty breakfast to start the day and a barbecue under the Northern Lights at the end of a great day’s fishing. 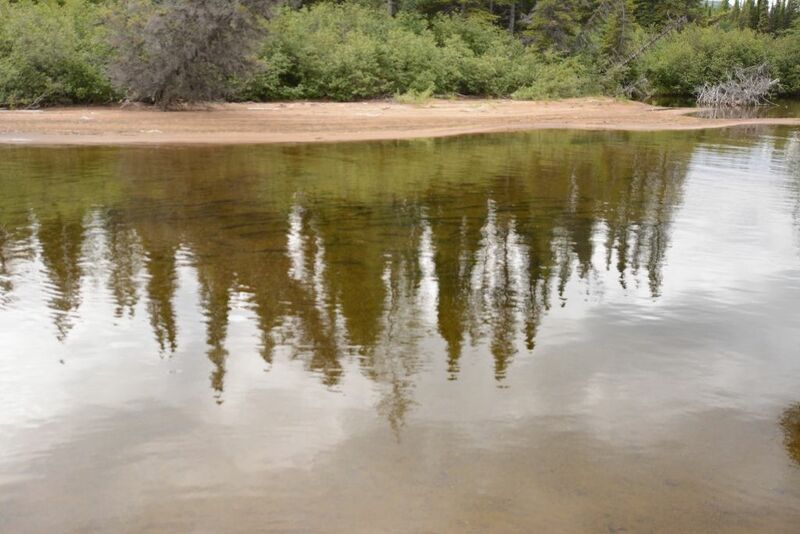 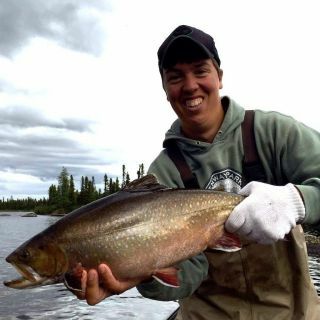 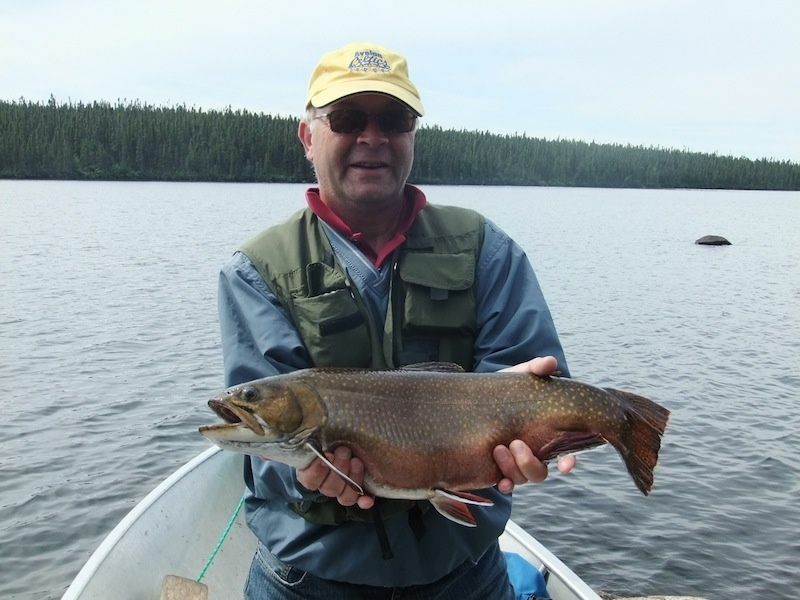 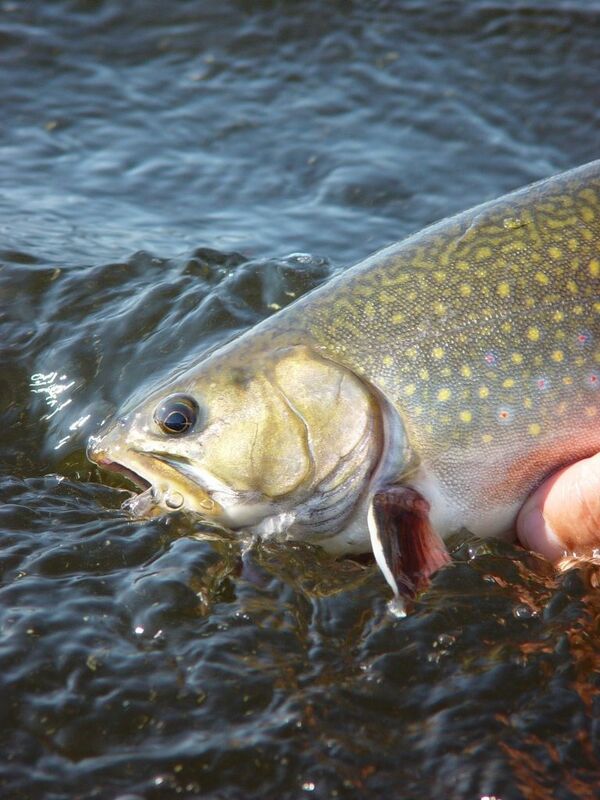 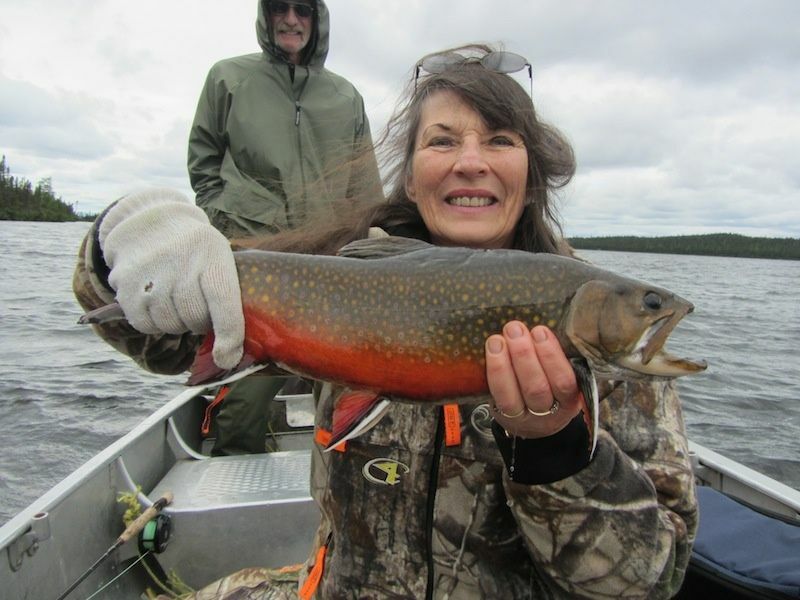 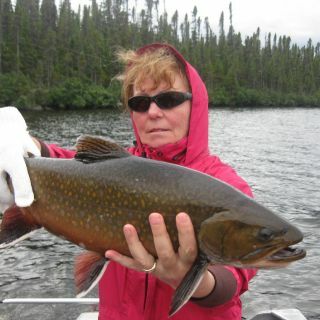 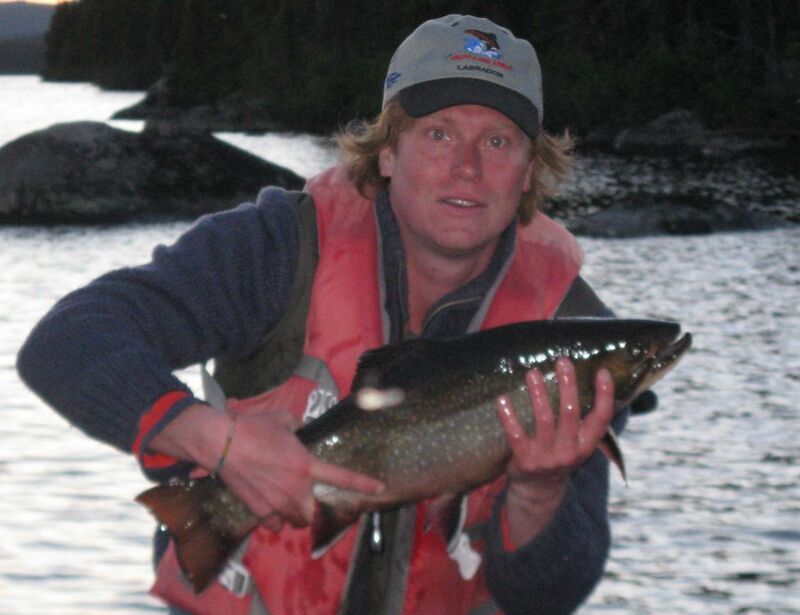 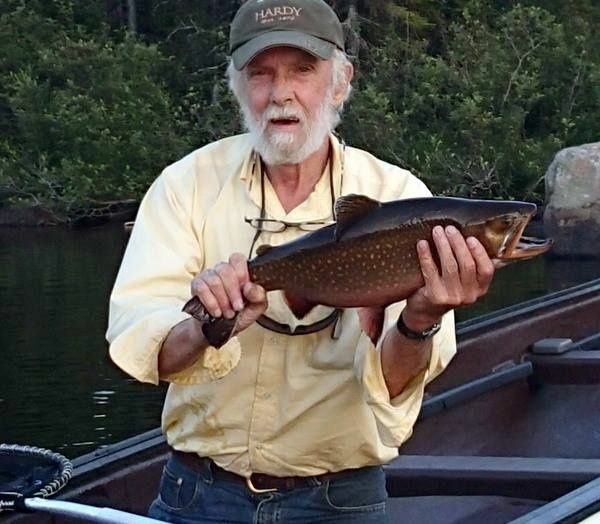 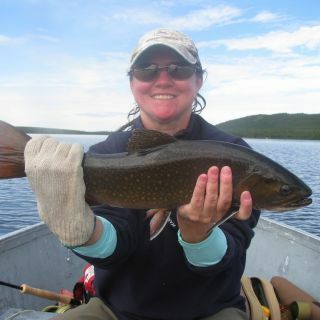 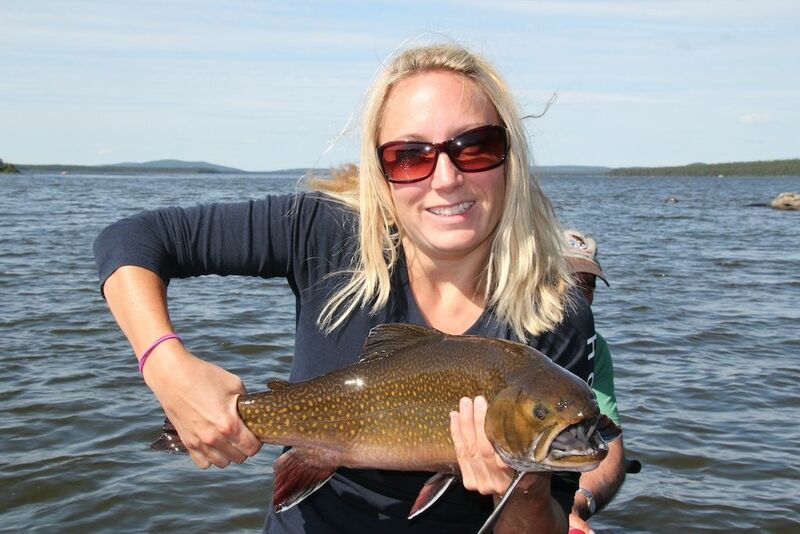 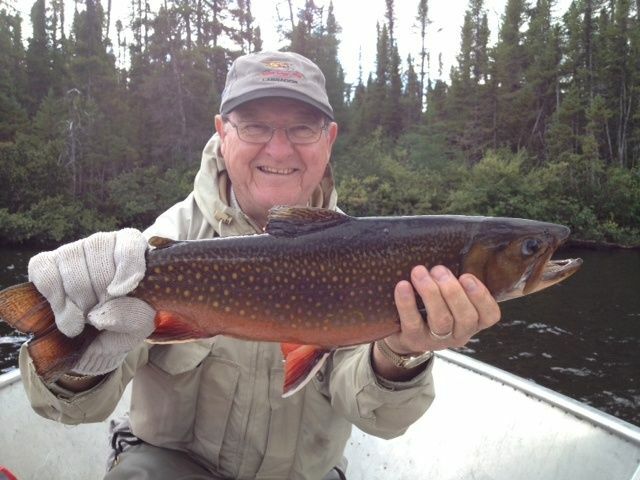 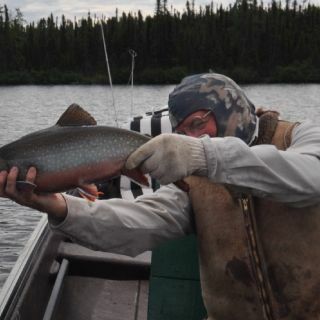 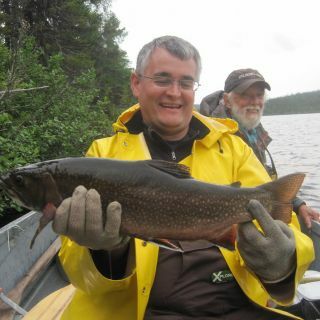 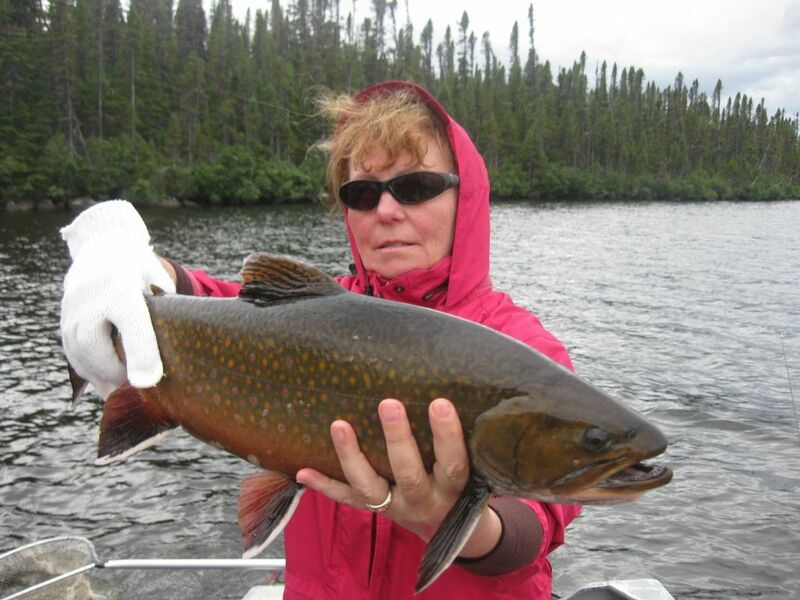 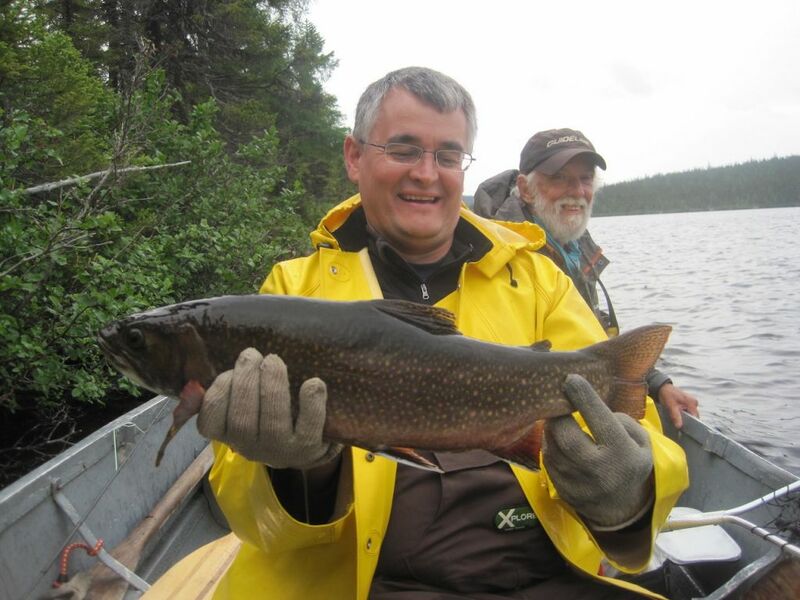 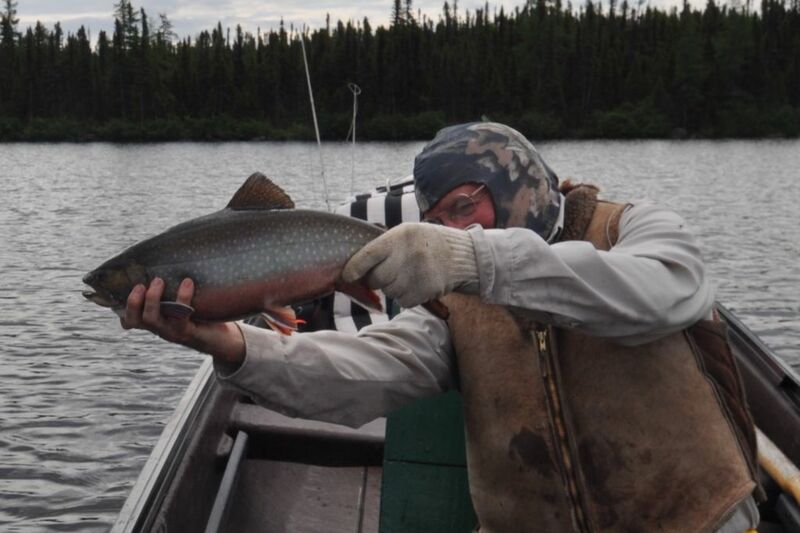 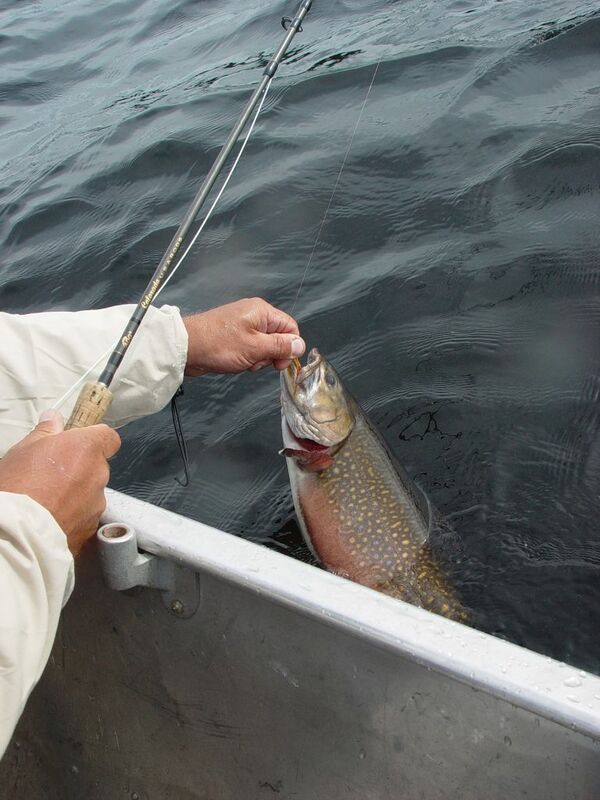 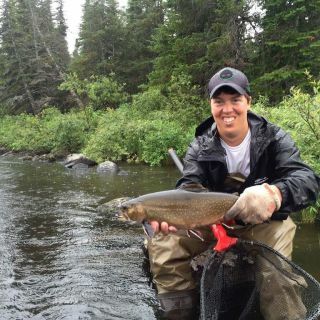 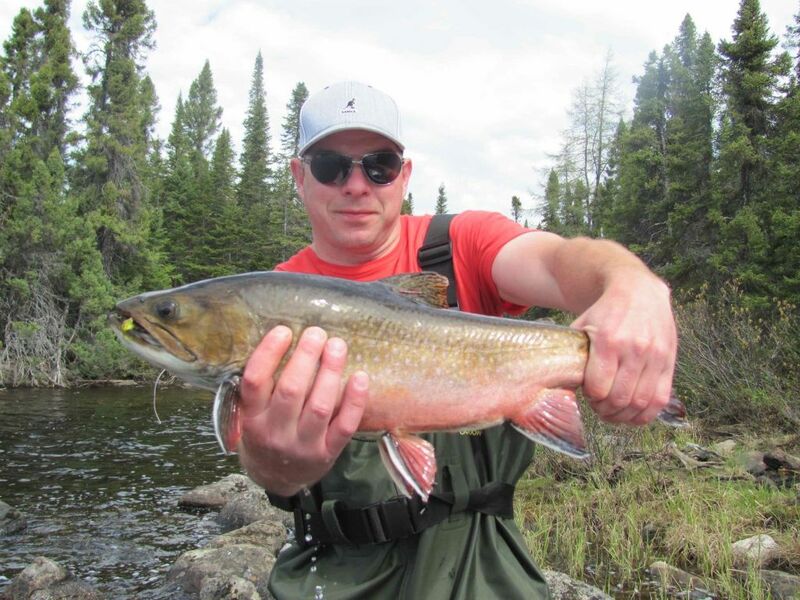 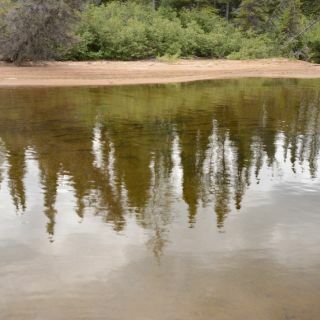 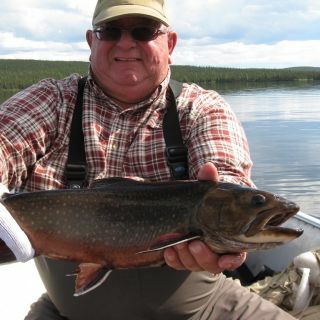 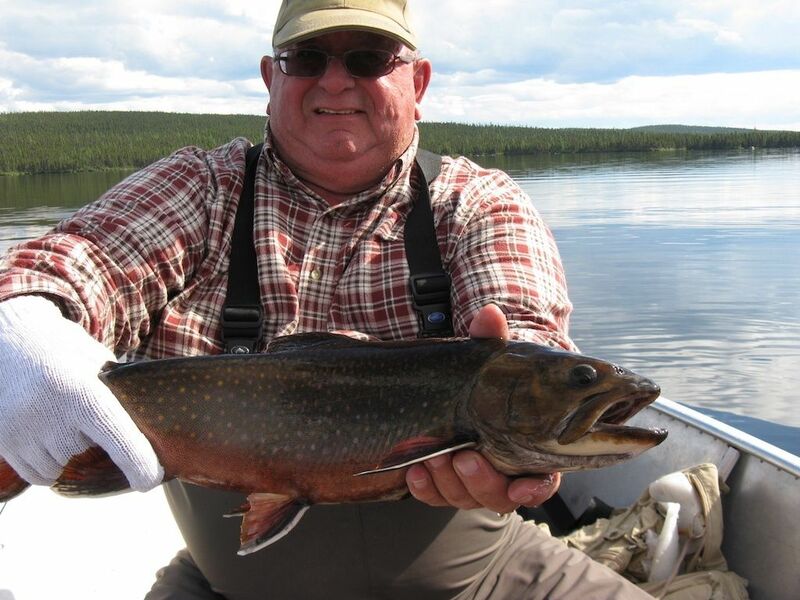 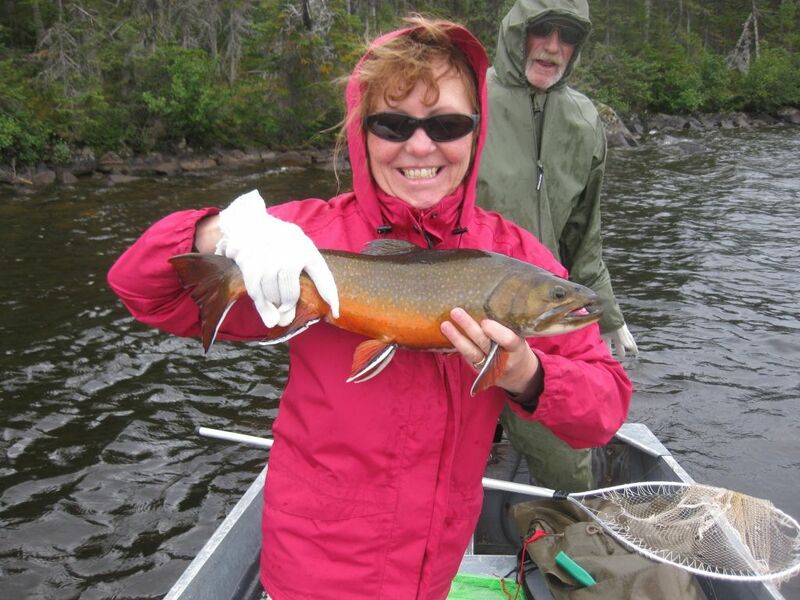 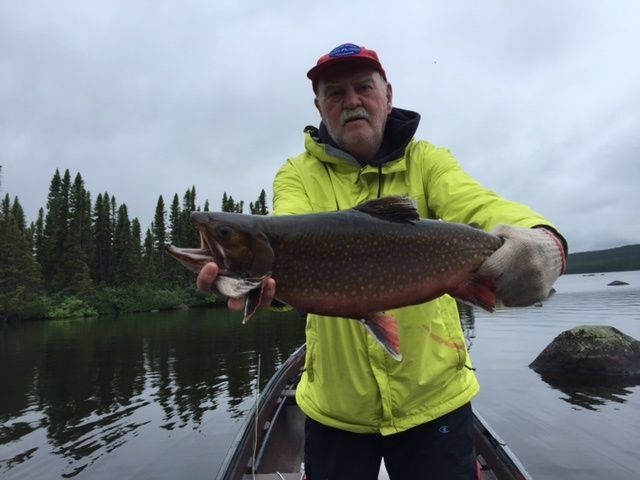 The guides know the lake and streams like the back of their hand and are dedicated to ensuring your success either fishing from the modern Gander River boats or waist deep in the amazing cool clear water of the streams.The hook and release practice guarantees an abundance of beautiful large brook trout. 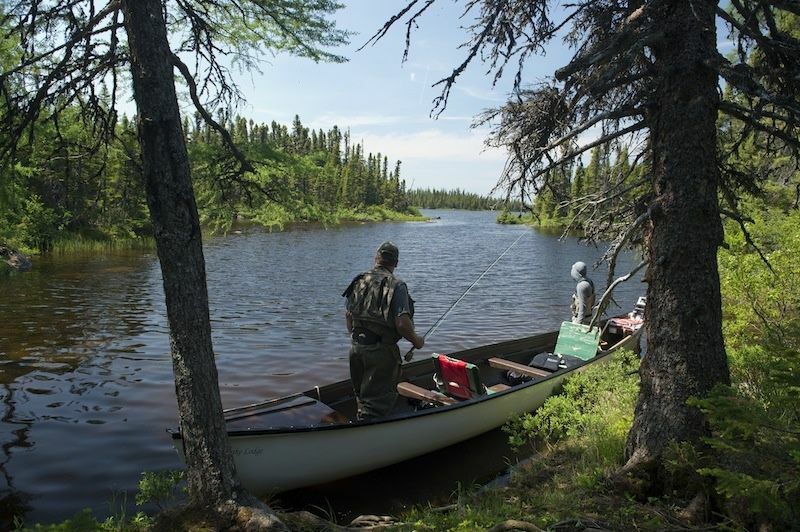 The call of the loons and the distant howl of the wolves add to the wilderness experience. 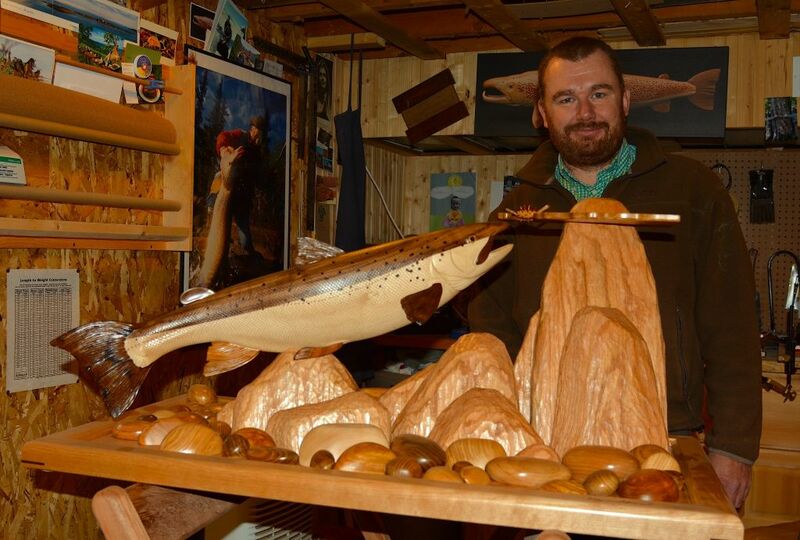 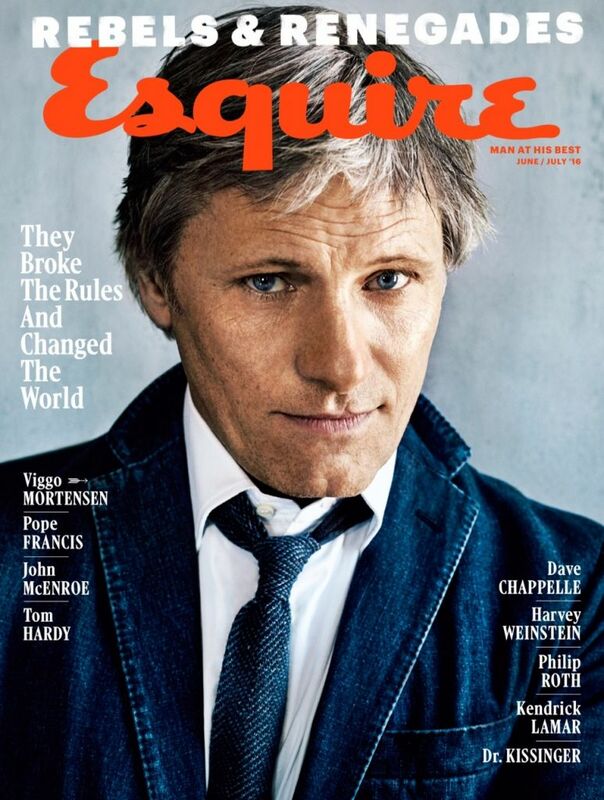 A top notch operation all round. 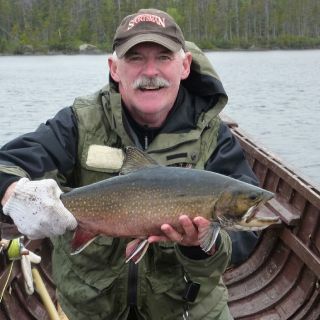 Jim Burton is the gold standard of Labrador outfitting.He is constantly looking for ways to improve his customers' experience.Igloo is a truly special place. 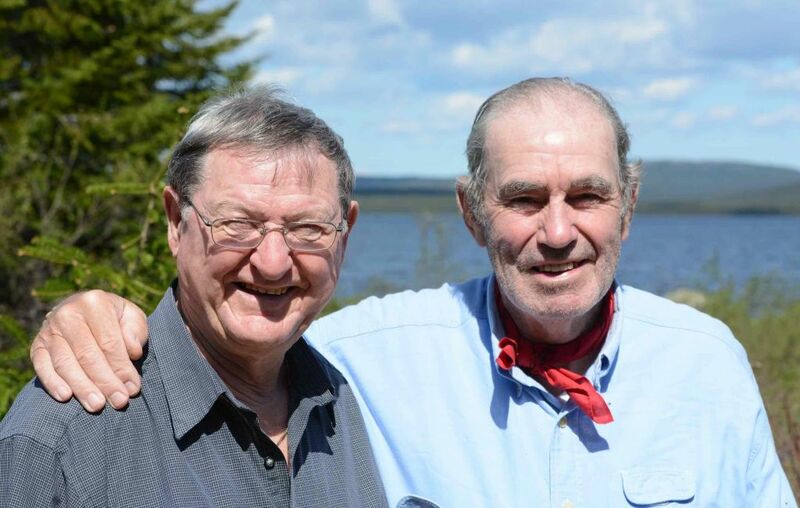 I have enjoyed Jim and his families' hospitality since 2008. 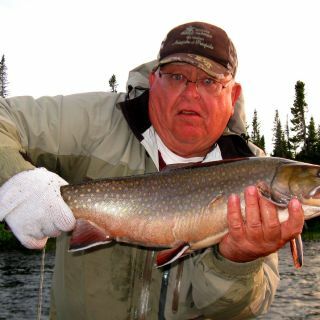 For starters, Jim's professionalism and experience in the outfitting business is clearly evident from the moment you meet him. 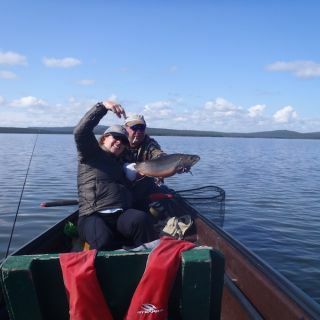 Every guest will feel that they are in good hands at all times. 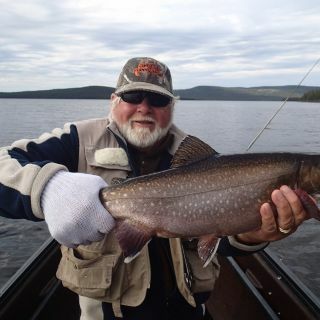 The fishing Igloo Lake offers is second to none for Brook Trout, and with the option to fish for Atlantic Salmon at Owl Brook, my opinion is that Igloo Lake Lodge offers one of the finest fishing opportunities in North America. 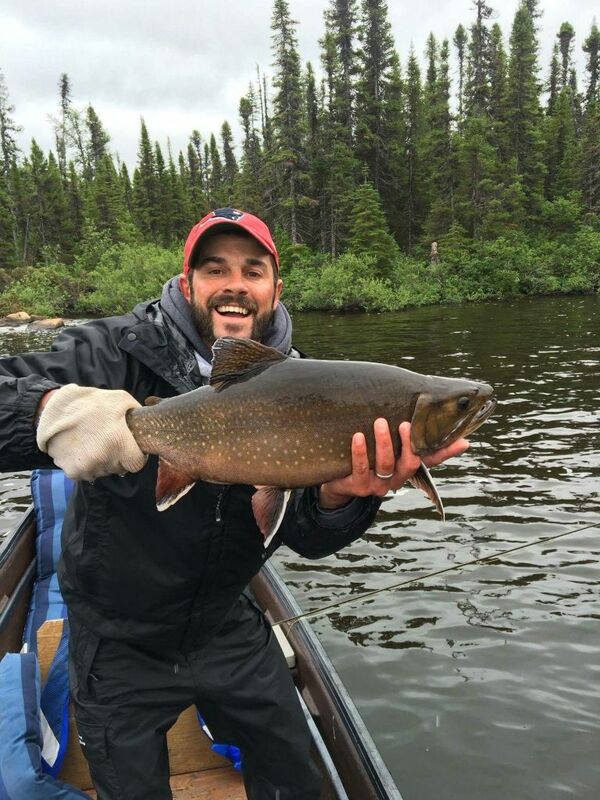 Definitely a five star experience! 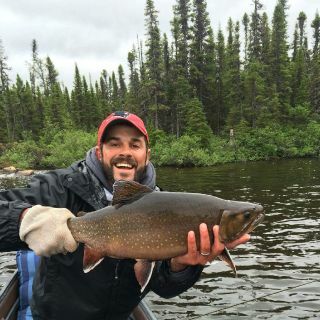 Monster Brookies, phenomenal guides and amazing food! 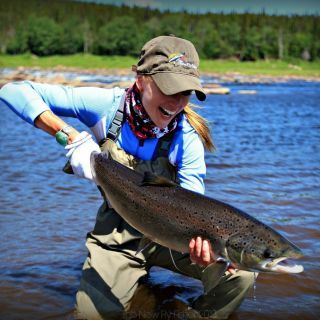 A must do on everyone's bucket list if you are interested in world class fishing! 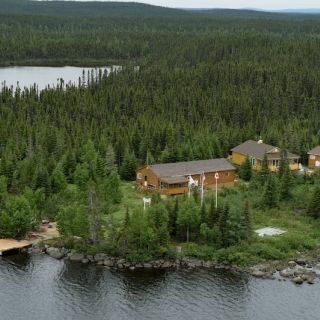 I highly recommend this lodge in the vast, unspoiled wilderness of Labrador. 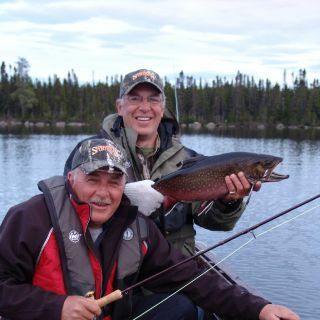 Jim Burton and his father Vince are probably the most successful outfitters in the business due to their attention to detail, their passion for the art of angling and their belief in the catch and release philosophy! 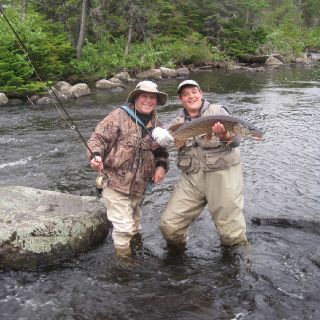 This lodge truly offers a once in a lifetime experience, one I am sure you will have trouble experiencing just once!!! 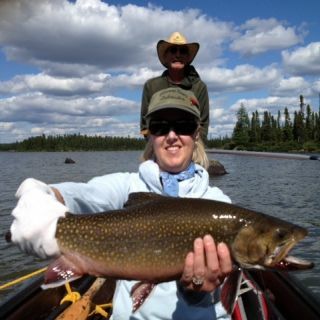 IGLOO LAKE LODGE - What can I say after 11 trips in 12 years? 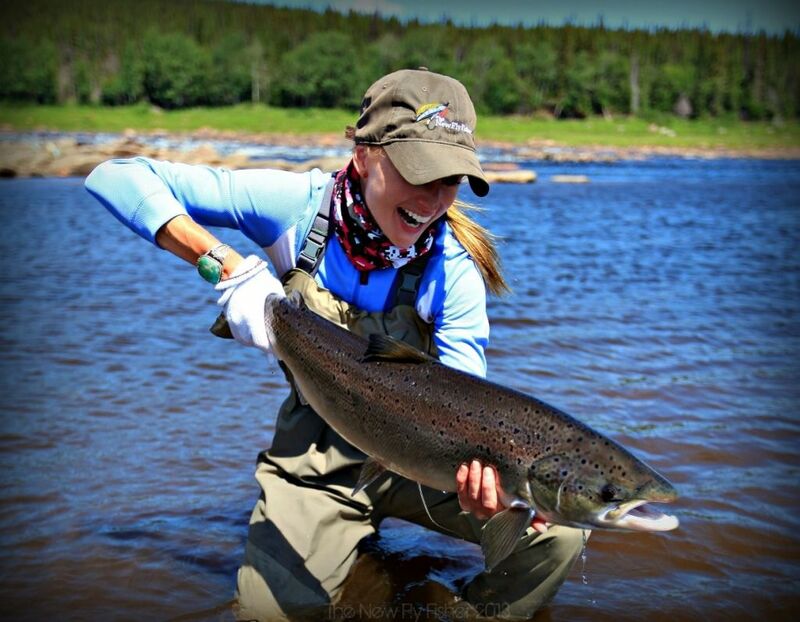 Unbelievable fishing!! 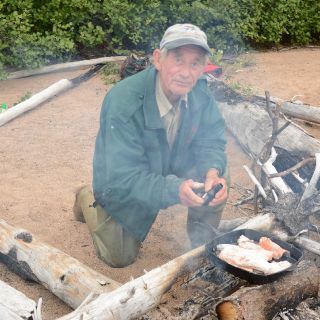 Great eats!! 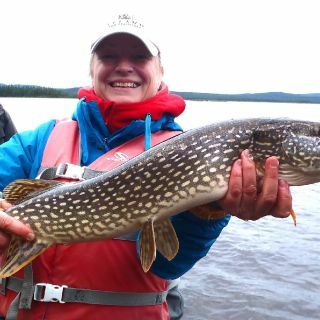 Knowledgeable and experienced guides!! 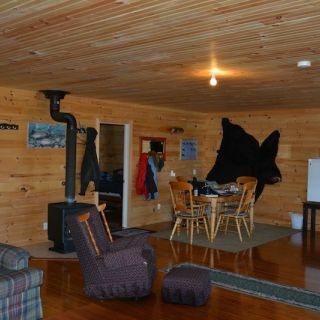 Comfortable accommodations!! 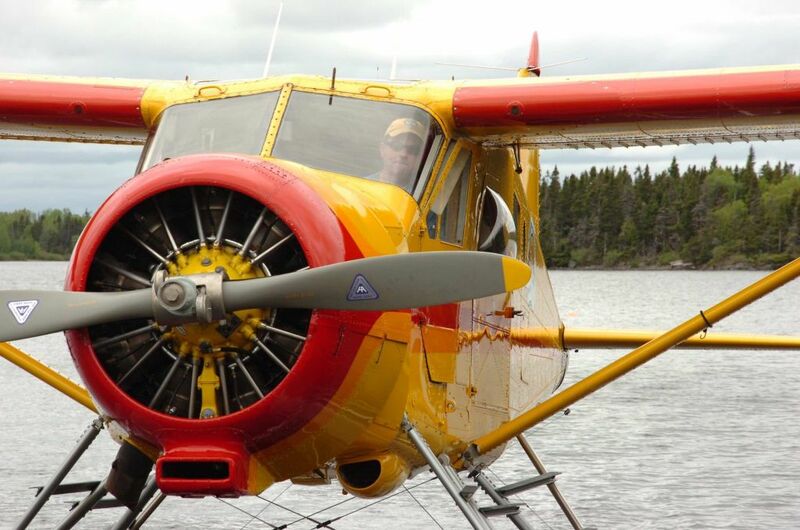 Flying in the co-pilot's seat of Jim's Beaver!! 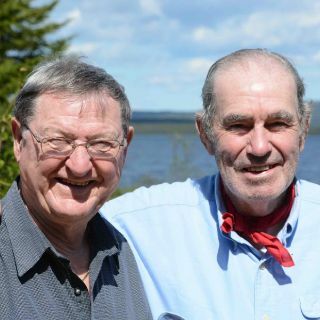 AND the best hosts (owners Jim and Vince Burton)!! 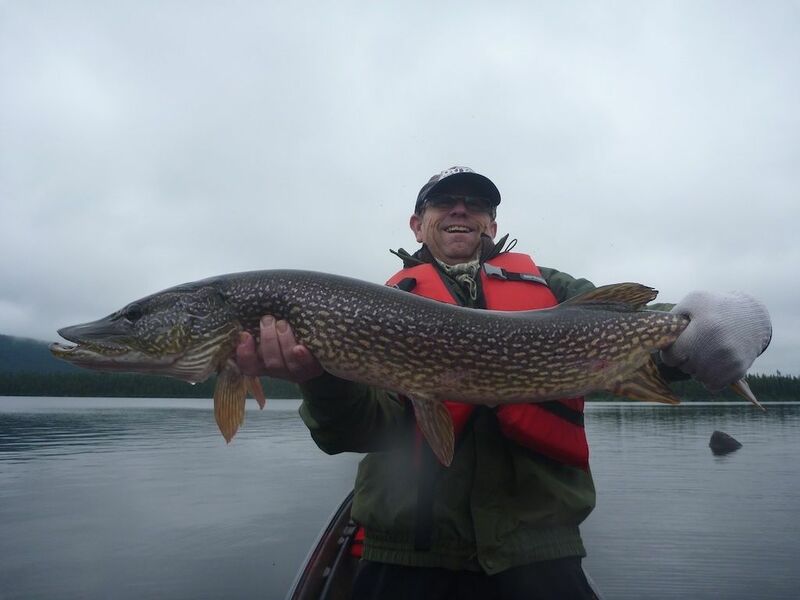 , or Northern Pike up to 4 ft. long, Igloo Lake is the place for you!! 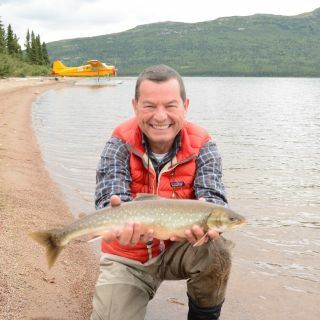 When the Mayfly hatch is on, and those big Brookies are slurping in the hatch, and you lead them with a dry mayfly, hold on tight! 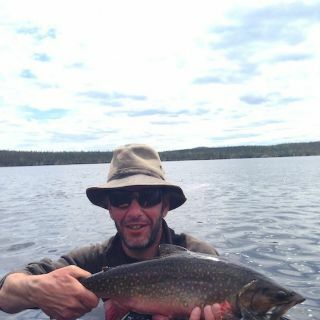 Other than not jumping, I find the fight of these Brookies as good as an Atlantic Salmon grilse. 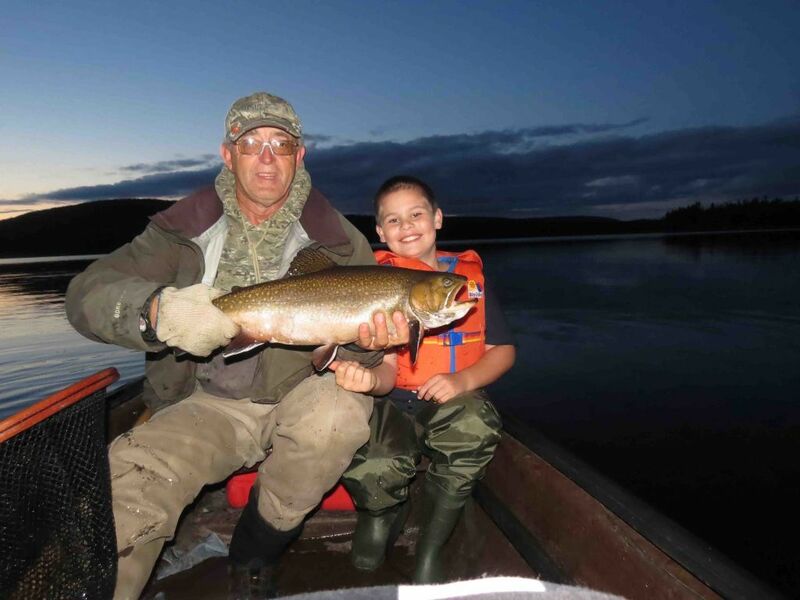 I've had the distinct pleasure of fishing at Igloo Lake about 14-15 times and last year was extra special as I had my 12 year old grandson with me! 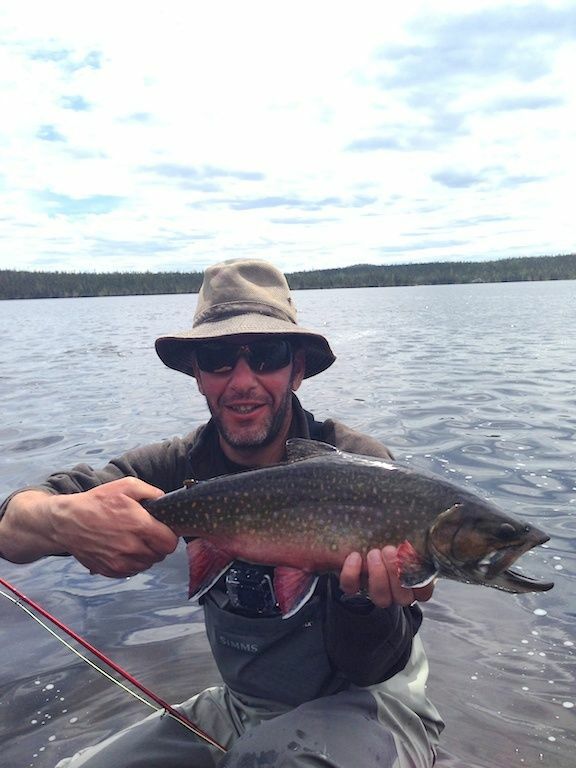 Igloo Lake will not disappoint the angler who's looking for the monster brookie! 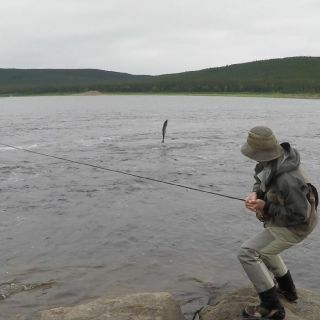 Prepare to hang on when the fish hits! 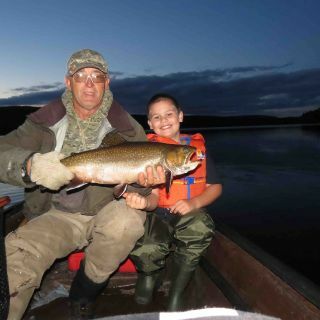 From the very first cast my grandson hooked into his biggest brookie ever and to see the excitement on his face and listen to his squeals of joy was priceless! 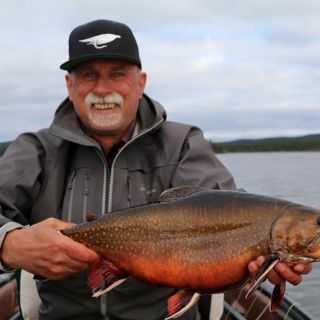 Over the years I'm sure I had done the same many times over as Igloo Lake produced many huge brookies for me, the biggest one weighing in at 9 pounds - a whopper to say the least! 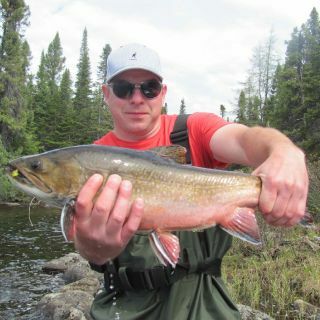 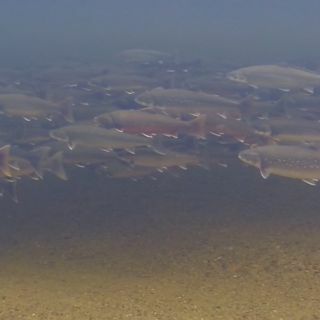 Where in this world can you find brook trout like this? 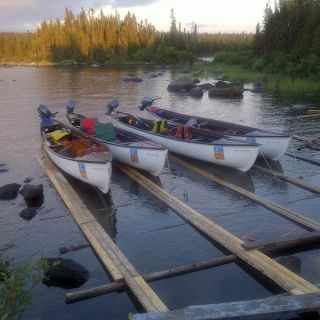 Very few places - but Igloo Lake has them! 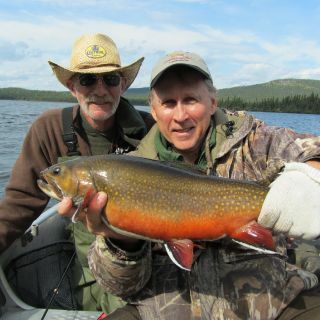 The lodge accommodations, guides, food and of course the owner, Jim Burton, just superb! 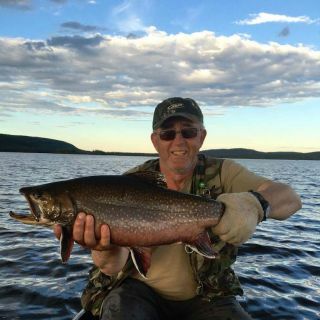 I'm looking forward to going back yet once again this summer in 2017 to catch more monster brookies, and oh I forgot to mention, fly outs are also available to catch other species - Atlantic salmon and Char, maybe I'll catch a few of those too! 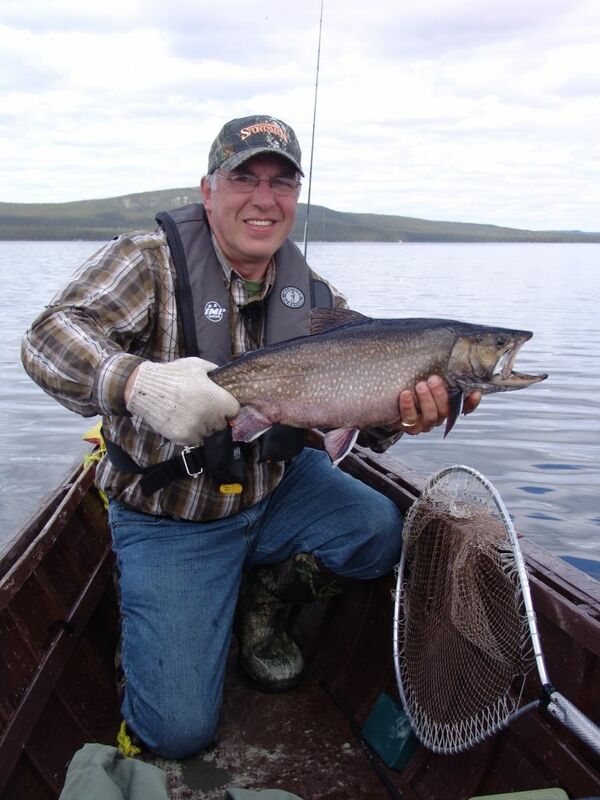 Igloo Lake, an angler paradise - a dream come true! 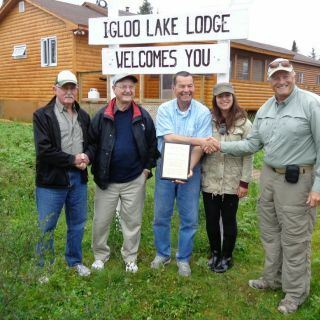 I had the honor of visiting Igloo Lake in August, 2016. 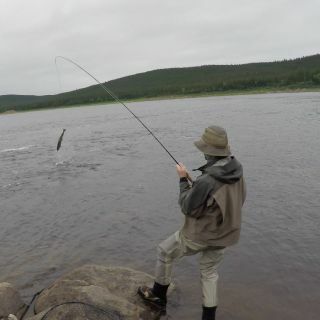 My week there was one to remember. 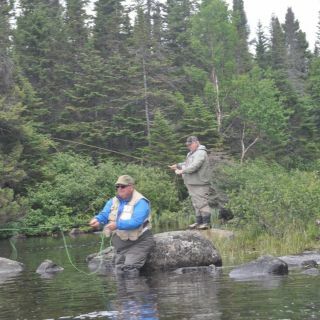 I was so nervous about going as I had not fished with a fly rod in decades, and my 8 year old son had never used one. 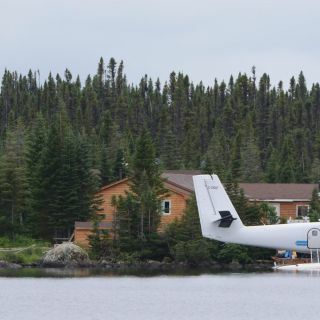 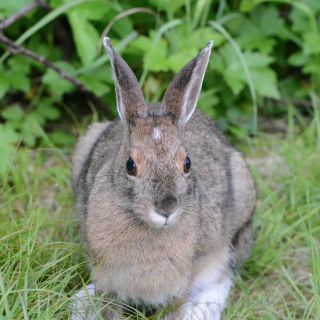 From the time we got to Goose Bay and were met at the airport, until the time you are back in the airport to go home we received nothing but the best of treatment. 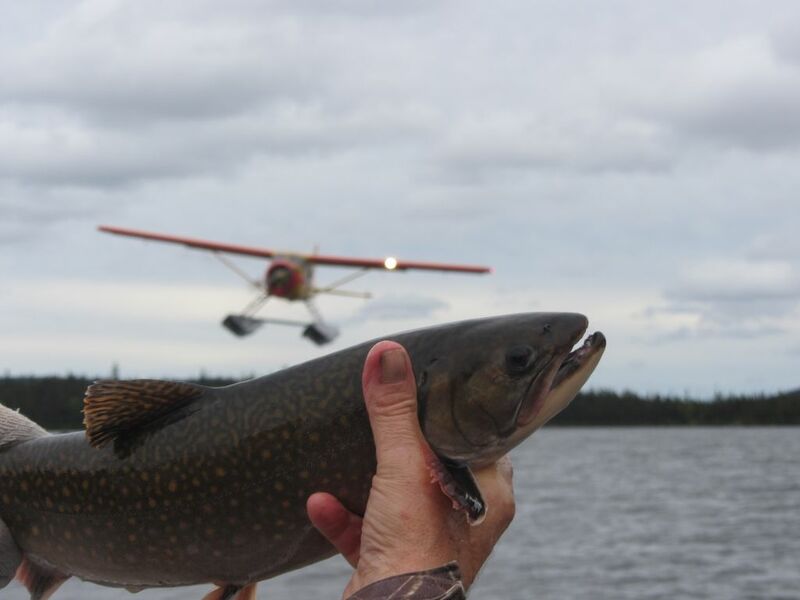 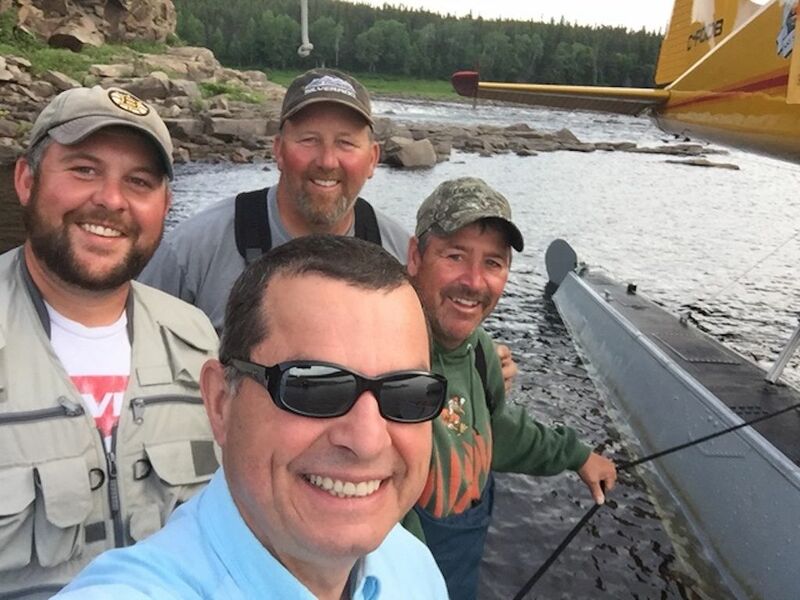 The flight to Igloo Lake in Jim Burton's Beaver float plane is an amazing experience in its own right, and as soon as you start fishing, you know it is going to be a great time. 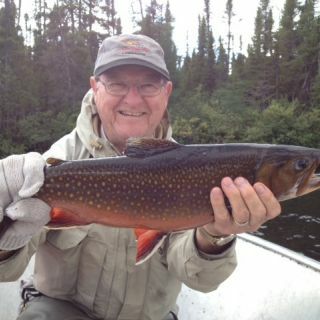 Our guide Edwin, took my son under his wing and taught him how to cast, hook, land and safely release both Brook Trout and Pike. 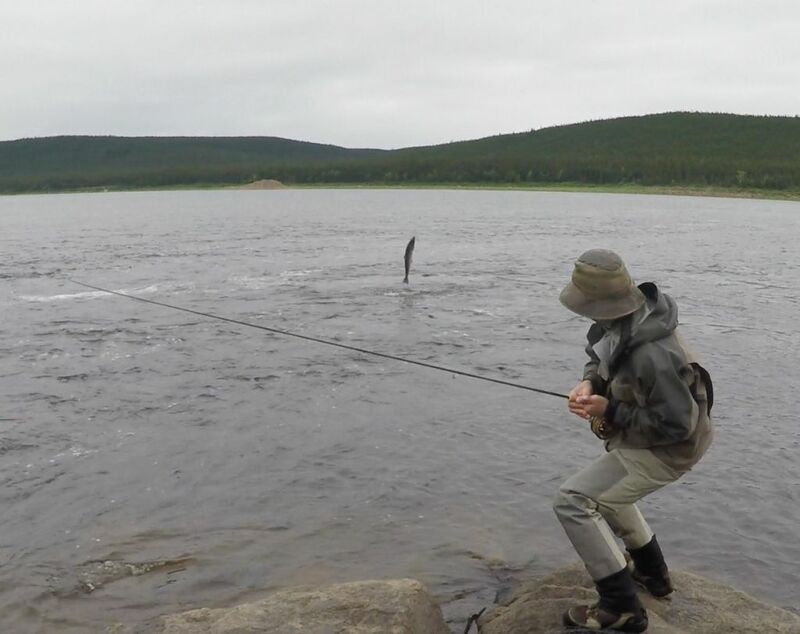 I learned so much by just listening to the instructions he gave my son! 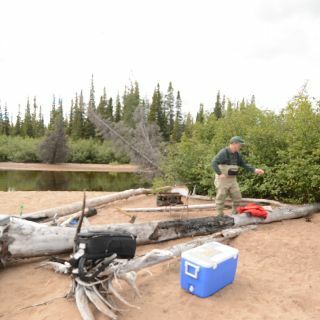 Our guide talked my son through the fight, never getting excited, just calmly instructing him. 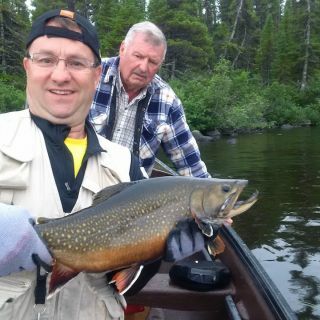 Our first night there, my son landed an 8 pound Brook Trout! 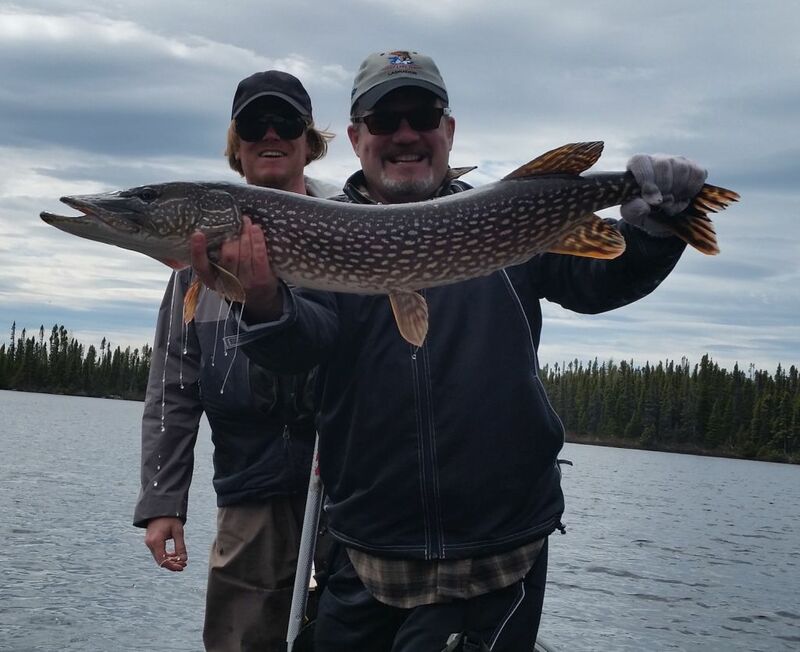 (photos and video below) On our last day, my son, landed a 15 pound Northern Pike. 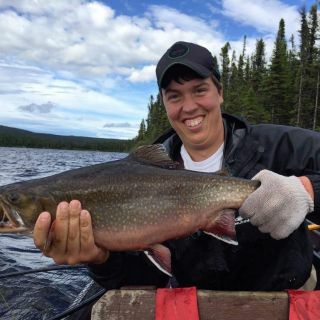 Before Igloo Lake, my son's largest Trout was about 6"long. 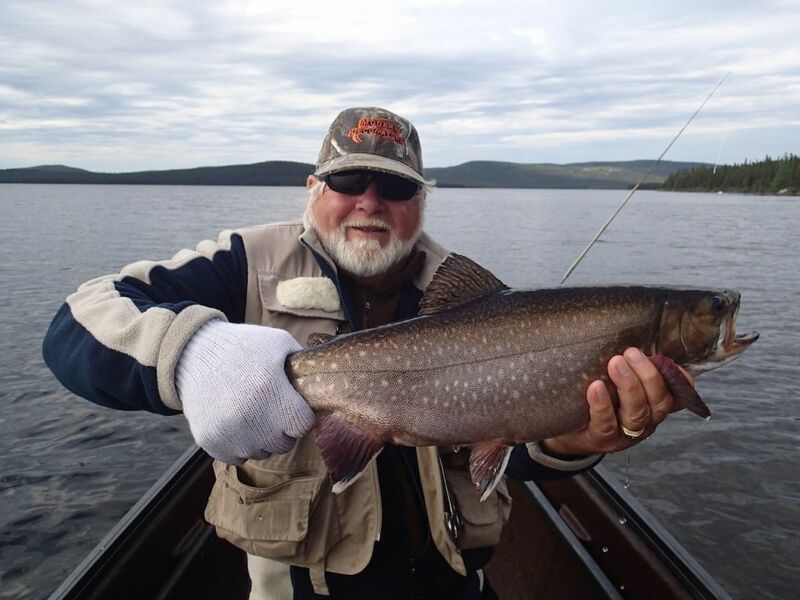 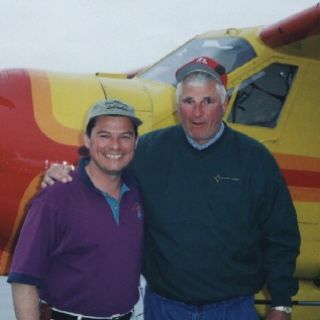 Between those two events were many more Trout and pike (100+), as well as great accommodations, first class food, friendship and wonderful experiences fishing in the great outdoors of Labrador. 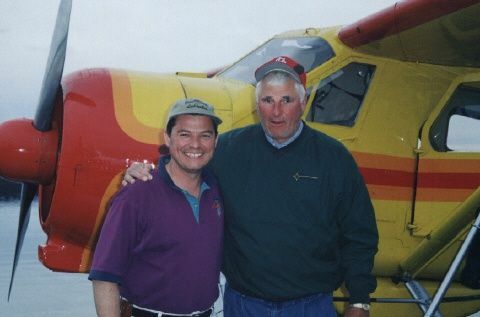 All of the Igloo staff were top notch and treated me, as well as my son and nephews, in a manner that was beyond all expectations. 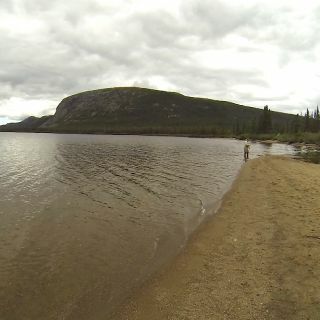 As someone who likes to take photos, it was a dream trip for me in that respect also. 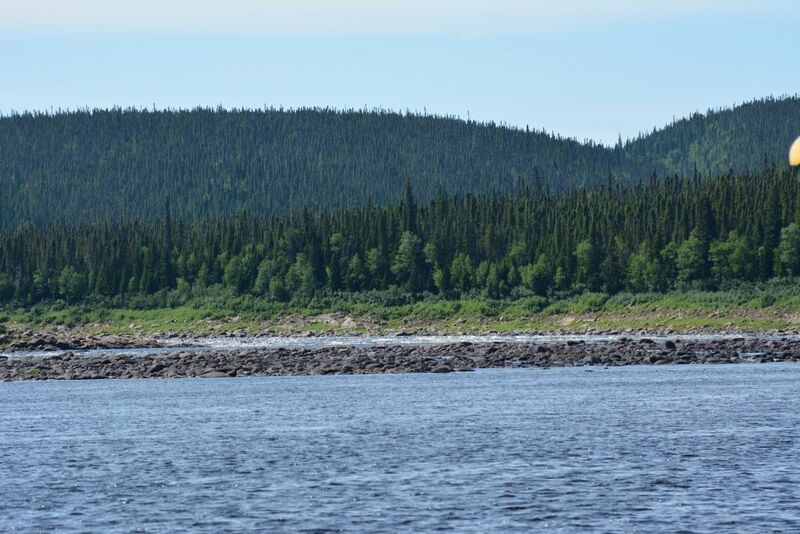 Lots of scenery, wildlife and even Northern Lights to liven up a night. 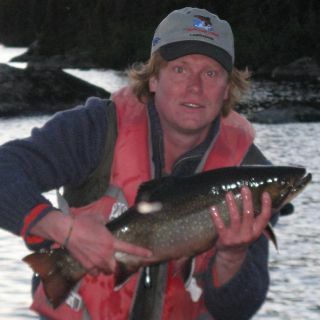 I have over 1800 photos to prove it. 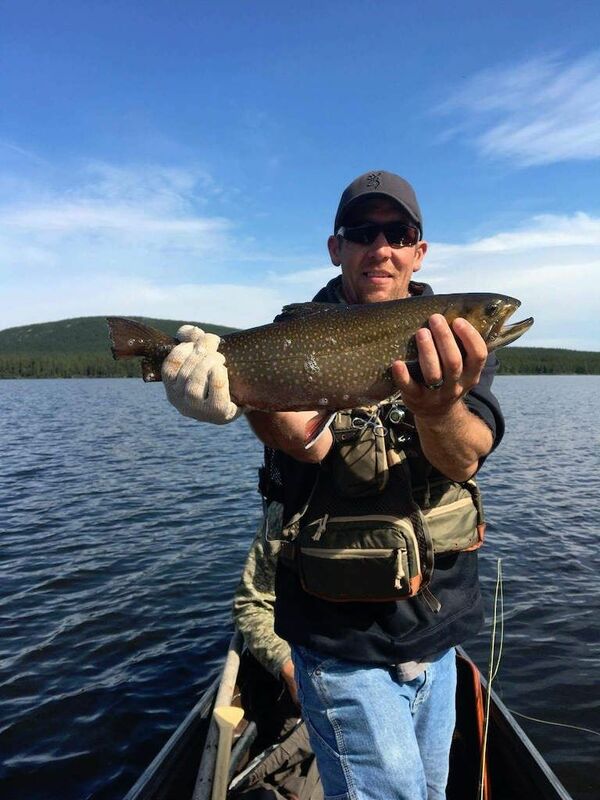 I would recommend Igloo Lake to anyone who loves to fish trophy Trout! 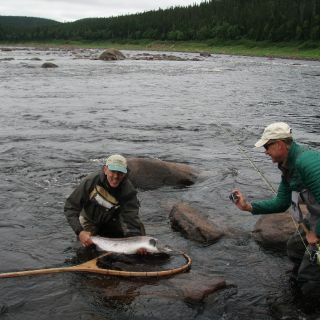 It was truly the experience of a lifetime!!! 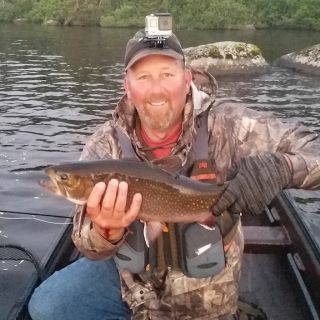 I spent quite a bit of time at Igloo Lake, this place is where you go to fulfill your dream of getting a world record Brookie. 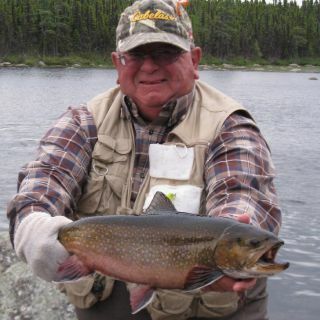 The lodge is great, the people are great and the fishin is more than you can imagine. 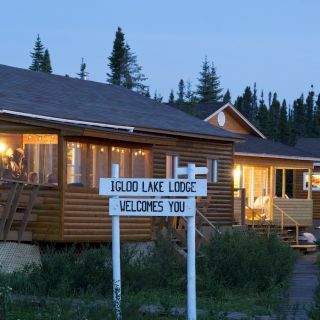 You won't go wrong by booking a week at Igloo lake. 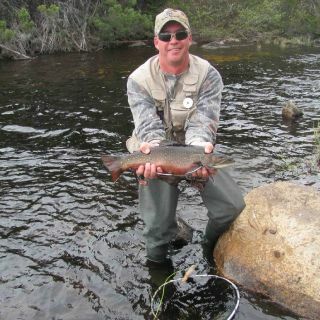 I am a fly fishing writer and photographer, and I have fished all over the world. 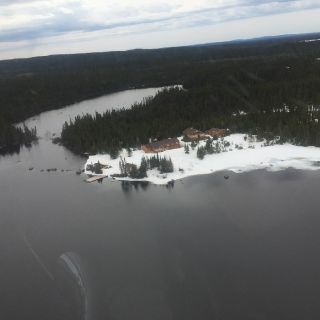 I can say without hesitation that Igloo Lake is a absolutely world class destination. 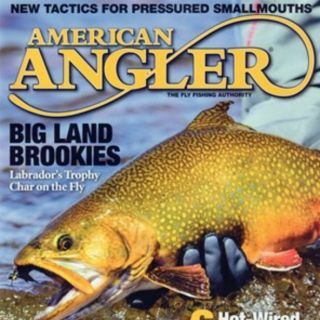 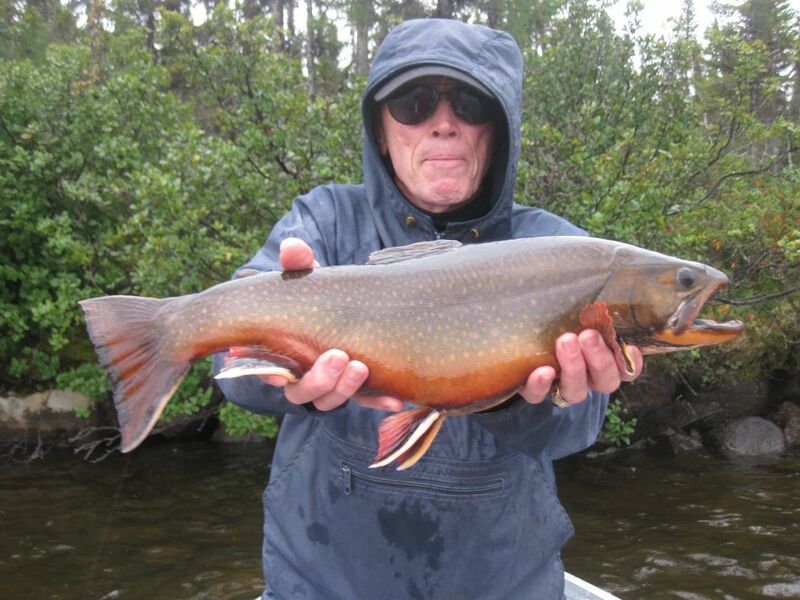 In my opinion it is stand alone best in the world for trophy sized brook trout. 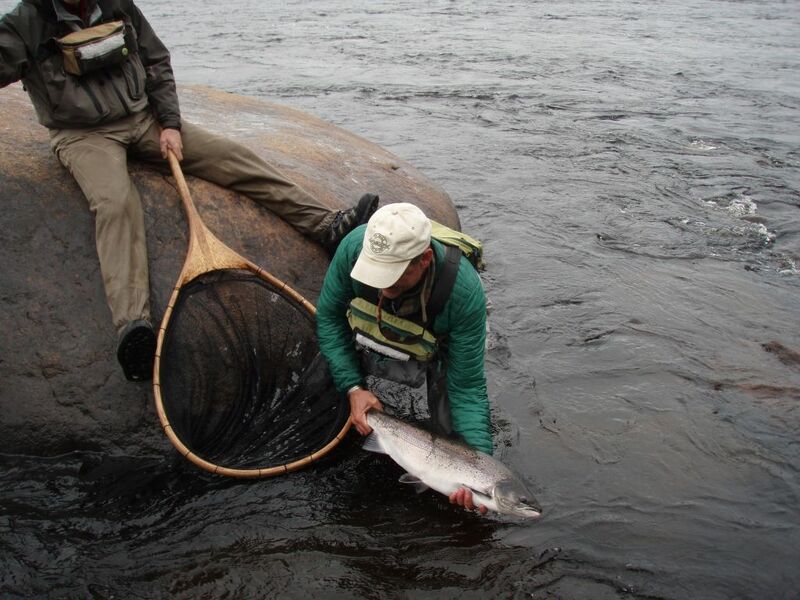 I have fished Igloo at various times of year and all have been fantastic angling experiences. 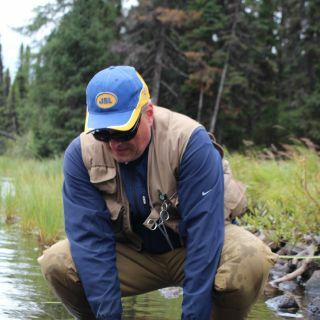 The dry fly fishing in June is phenomenal, the freshwater equivalent of sight fishing to bonefish on the flats, or permit. 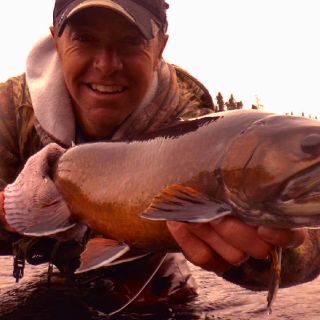 Another time I fished late season and went down under with leeches and nymphs. 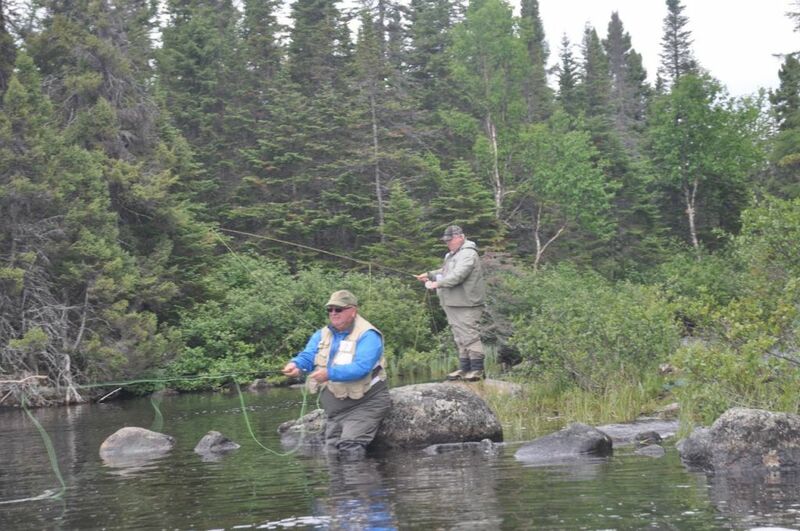 On that trip I experienced the best hour fishing of my entire life, and the pool was a mere 2 minute walk from camp. 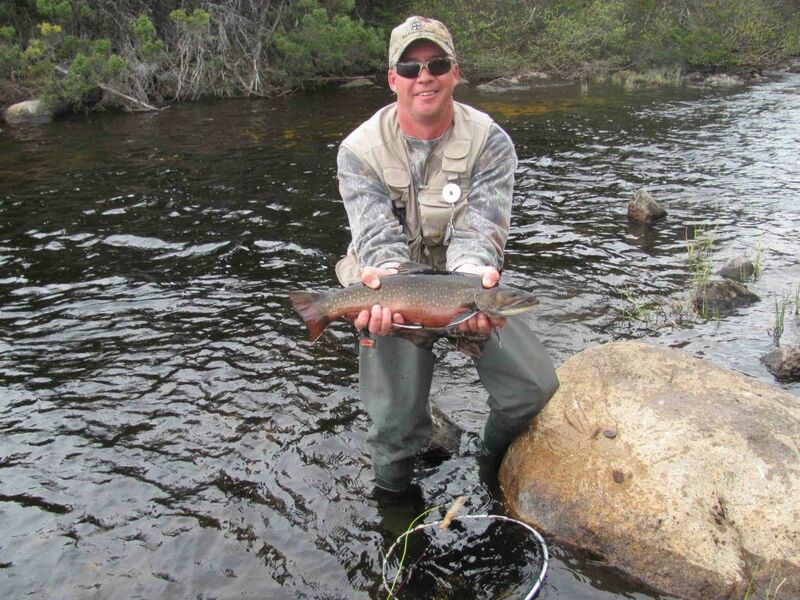 If you are a dedicated fly angler, this place should top your bucket list. 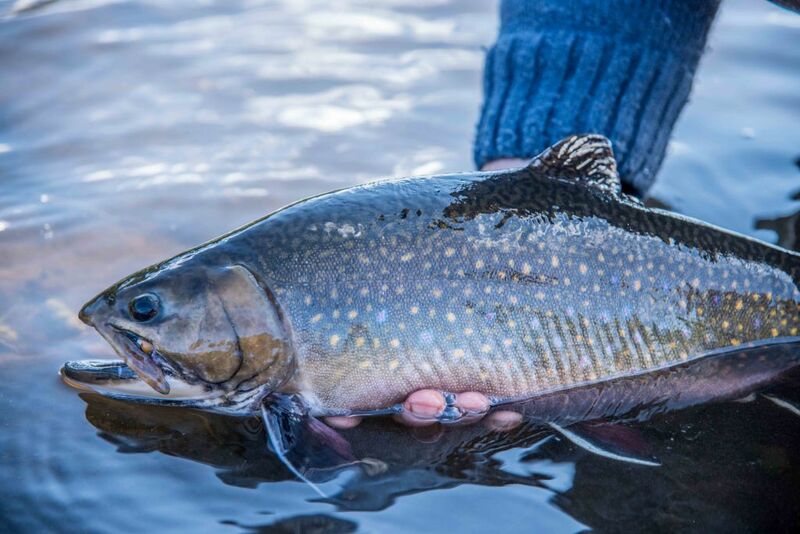 It's to brookies, as the Rio Grande is to browns, or the Alta or Ponoi to Atlantic salmon. 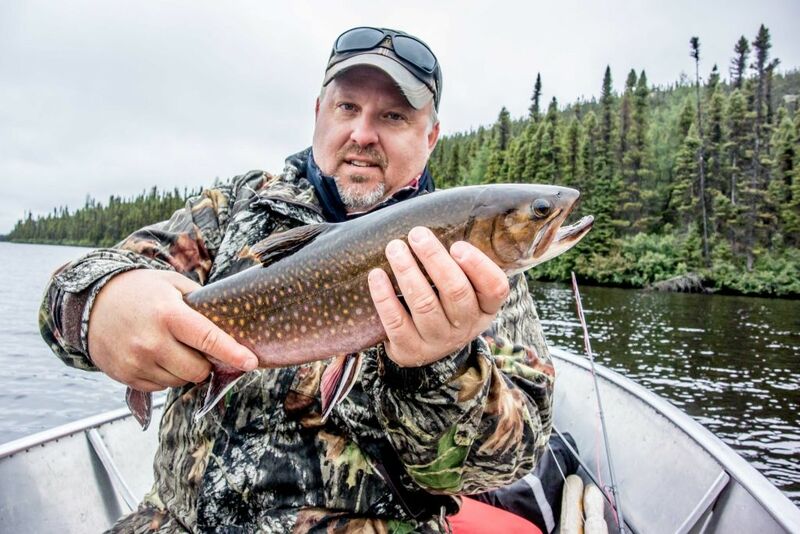 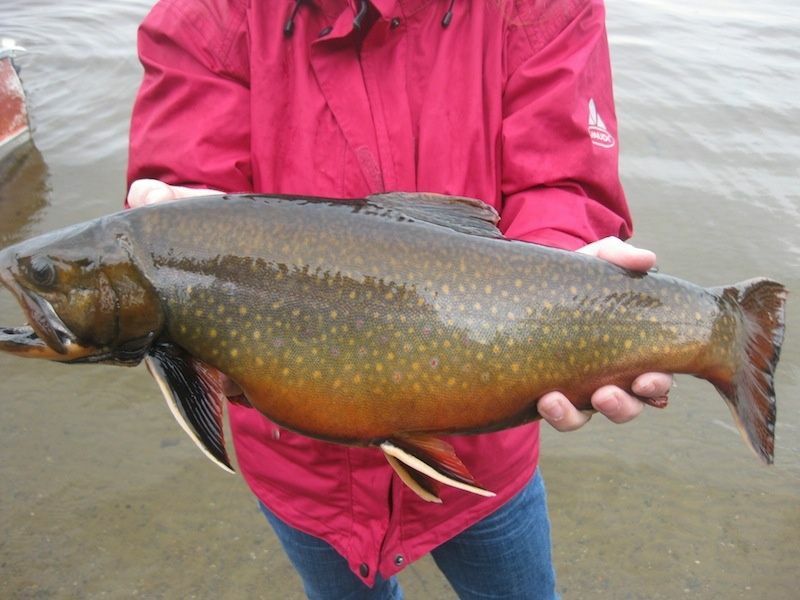 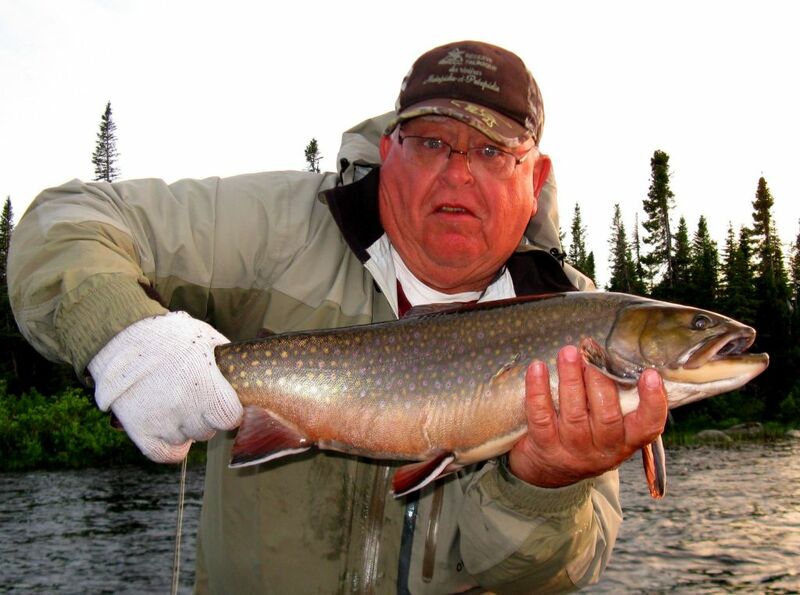 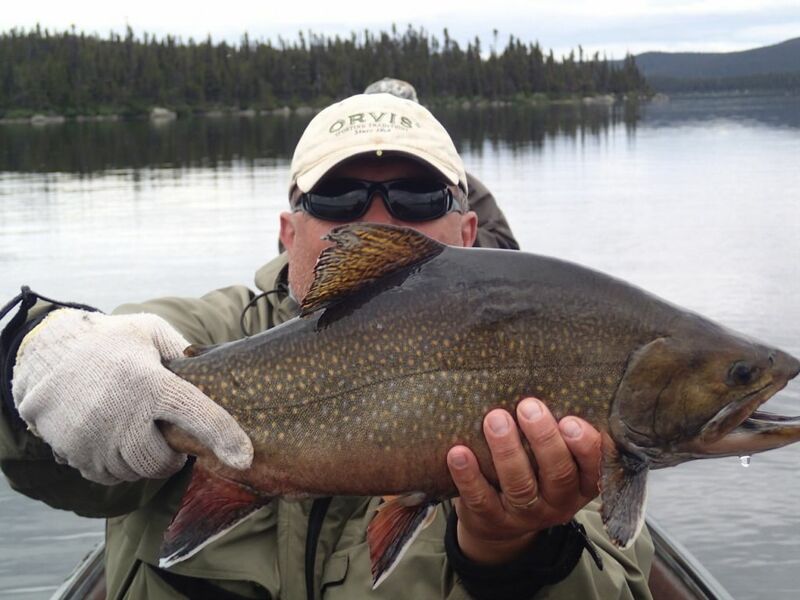 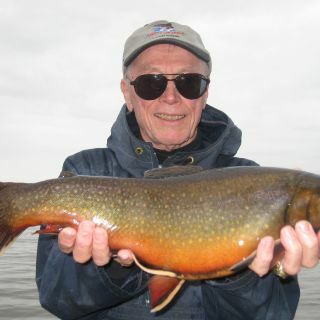 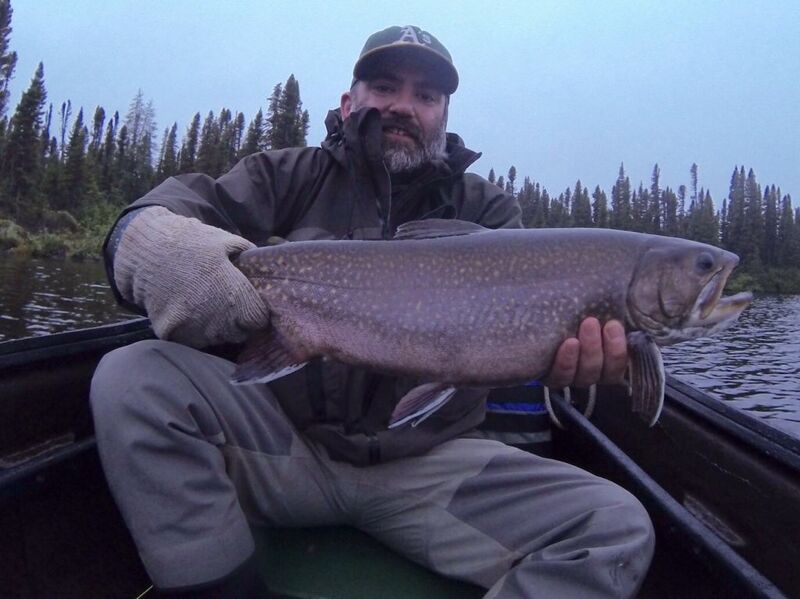 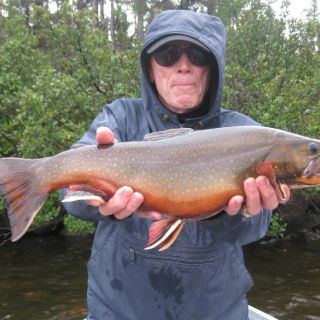 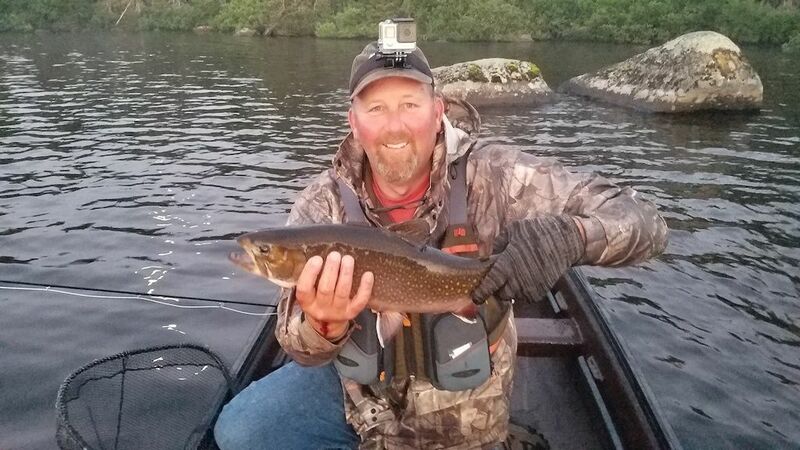 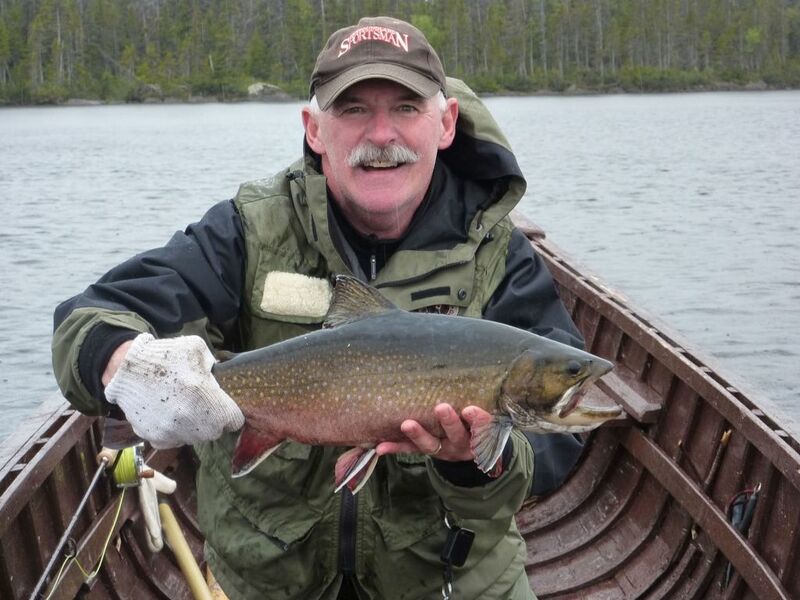 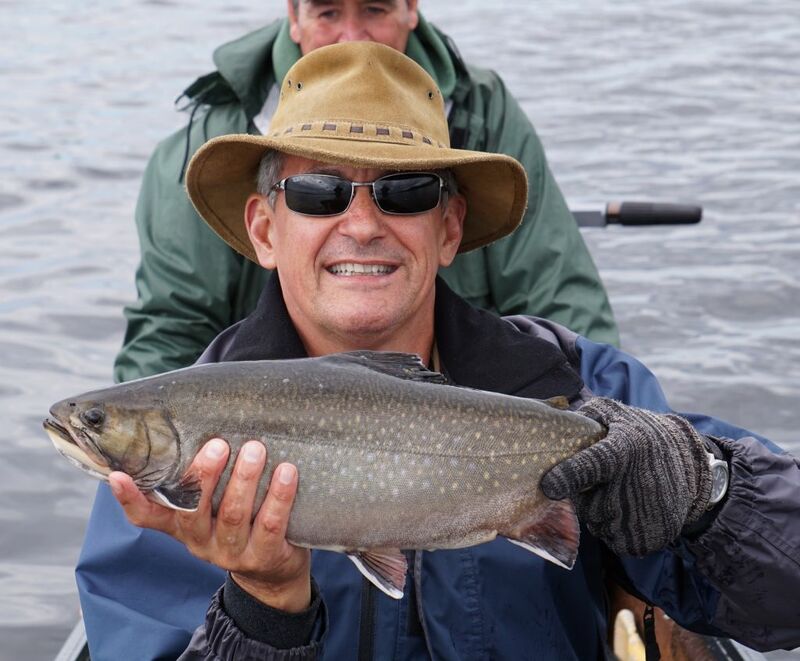 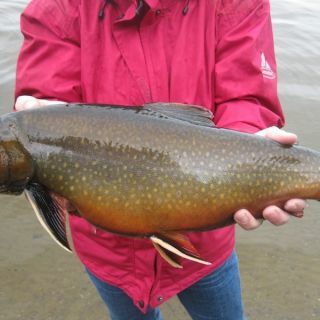 Igloo Lake Lodge presents the greatest opportunity in the world to catch large numbers of giant brook trout averaging over four pounds on a fly. 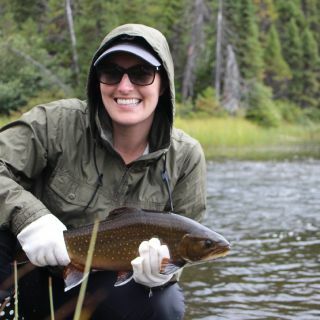 When I wanted my bride to fall in love with fly fishing and be my fishing buddy for life, that's where I took her. 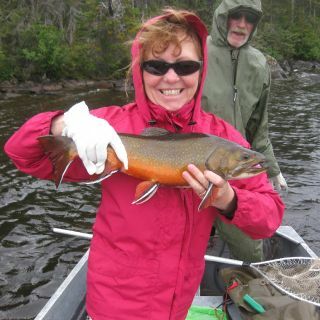 Her success and excitement hooked her irretrievably. 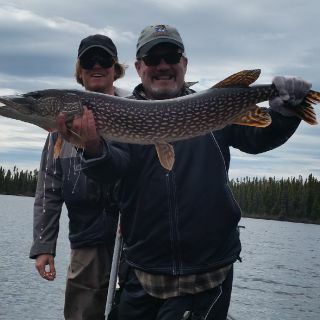 The Burton family is all class and ethics striving to provide and preserve a world class fishery at a cost that no other outfitters can match for comparable quality of experience. 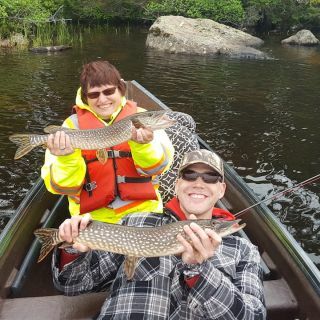 Their staff and dependability create a family atmosphere that spawns loyalty and great wishes for their continued success and emulation by others. 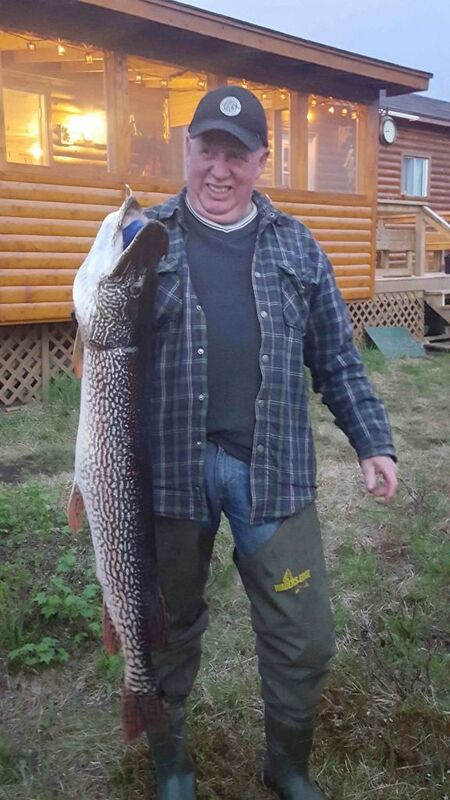 I have been hunting and fishing since the age of 4. 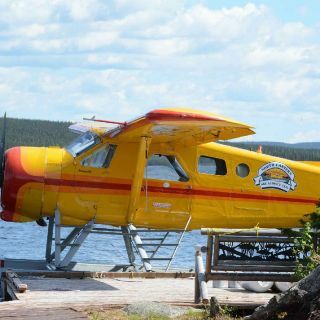 Been to many different resorts and camps of all kinds and can say the overall experience from when your picked up in Goose bay till your dropped off is as good as it gets! 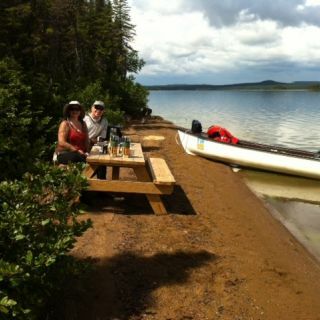 The staff are simply the best from owners, cooks and guides this place is second to none. 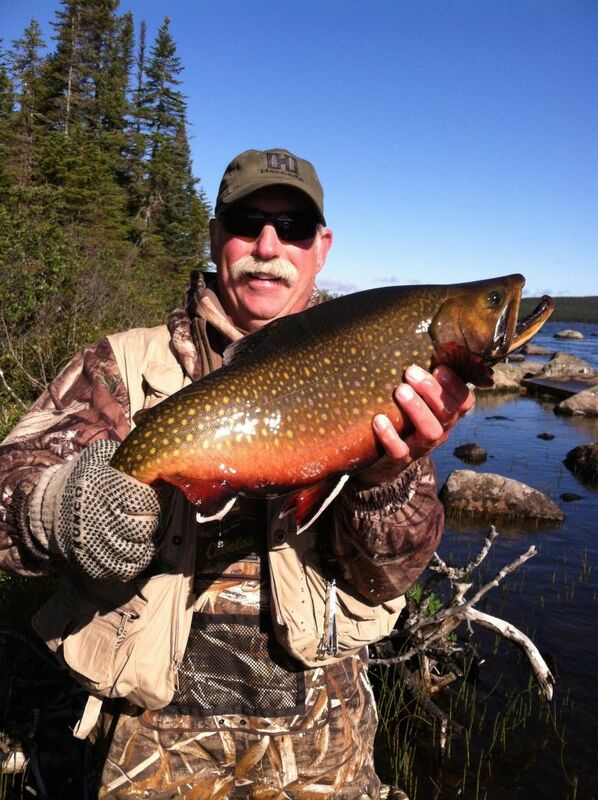 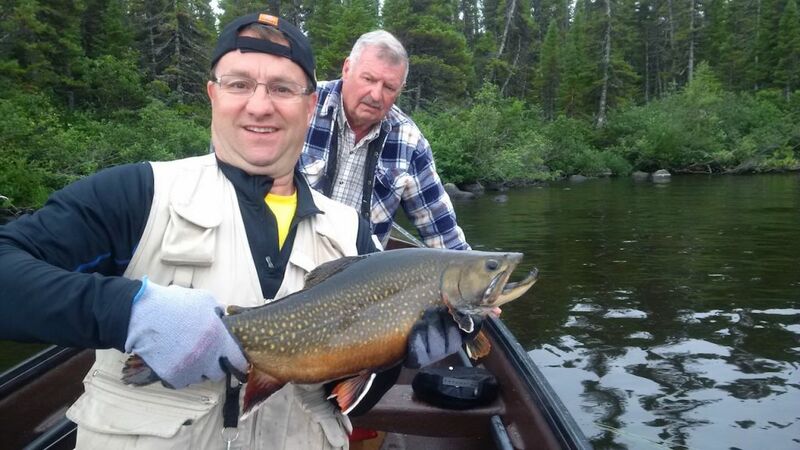 Where else can you go and fish for trophy Brook Trout, Northern Pike, Artic Char and the champion Atlantic Salmon. 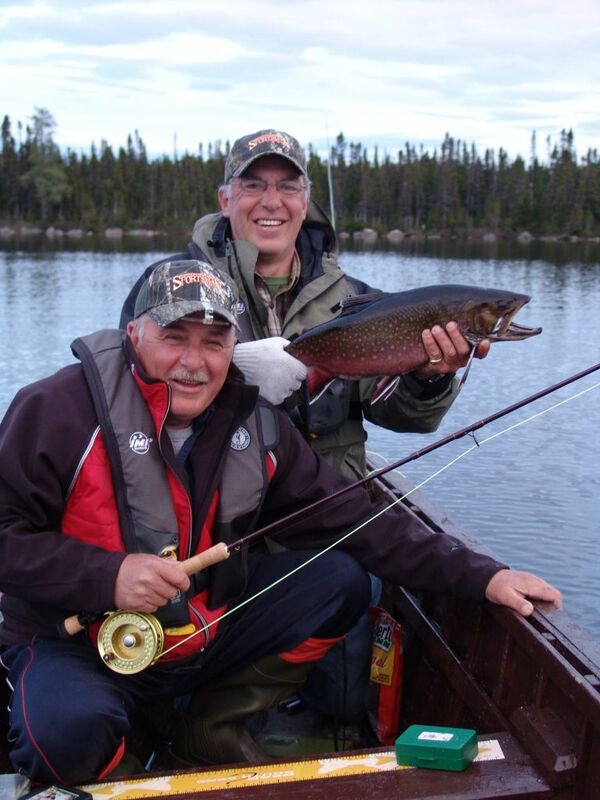 I've fished with Jim and the Burton family since 2008 at Igloo Lake Lodge and Flowers River Lodge. 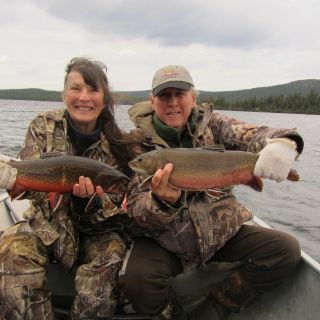 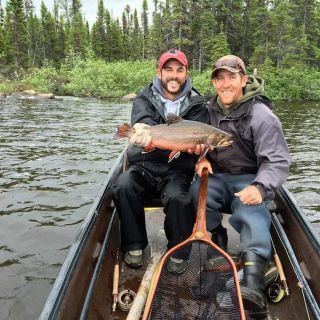 Each trip reflects a commitment to travel to Labrador and into the bush, and fishing fishing with the Burton family makes the decision to return easy! 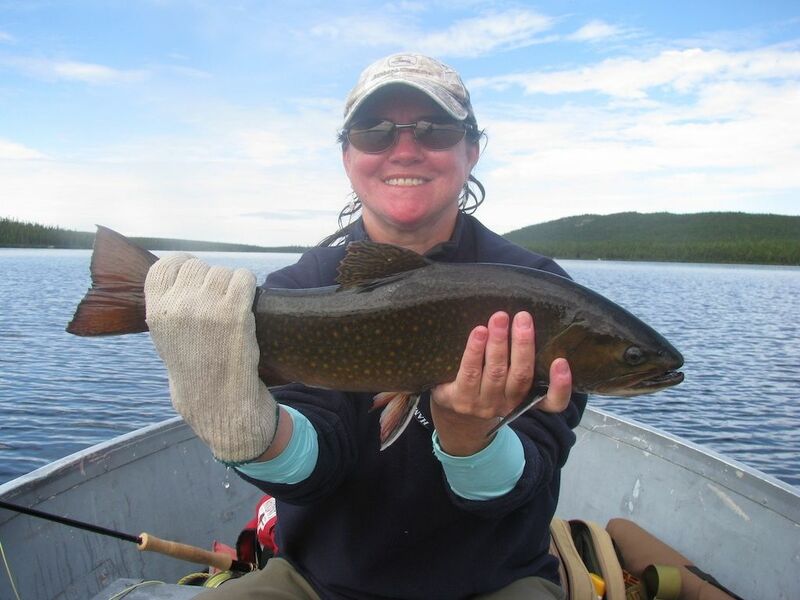 Case in point: I'll be spending 10 days fishing out of Igloo Lake Lodge in 2017! 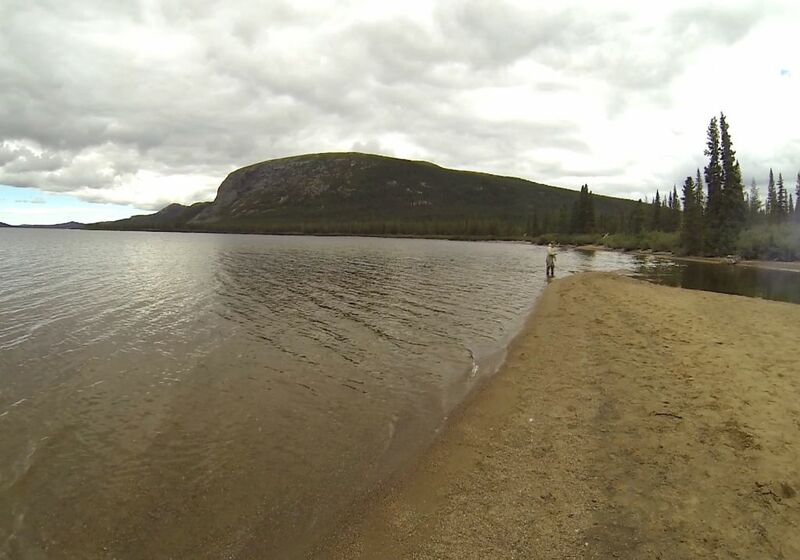 I visited Igloo Lake for the first time last July (2016) and will return this July for my second visit, with much anticipation. 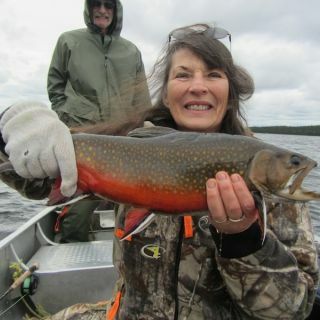 The brook trout fishing was fantastic! 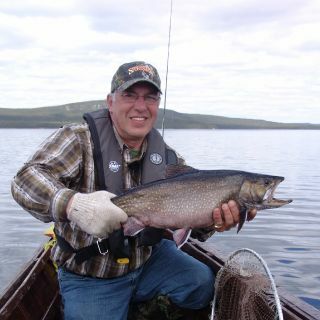 !...what I dreamed of as a kid and finally fulfilled that dream at Igloo Lake. 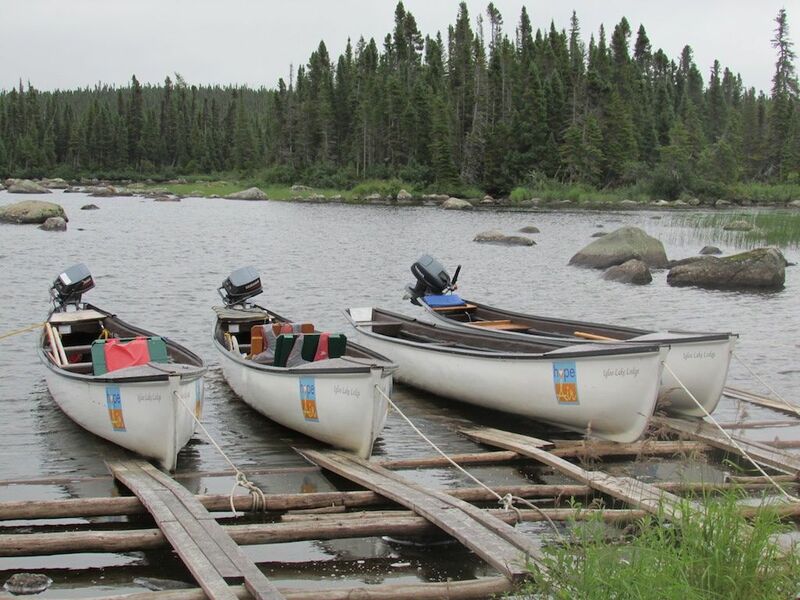 The lodge accommodations are first-class and the camp staff are very attentive and professional. 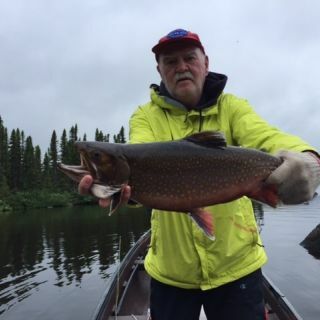 The boats are excellent and guides are very knowledgeable about the area and willing to share their fishing tactics with you openly and in hopes that you catch big fish. 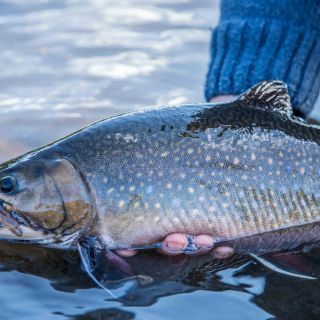 We enjoyed six beautiful days on the water and caught some of the biggest and most beautiful brookies that you could ever dream of. 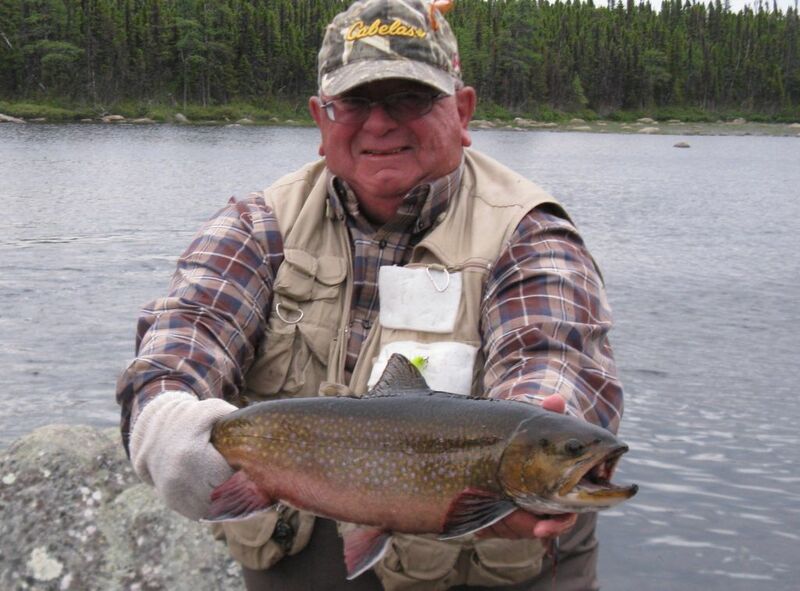 Jim Burton (camp owner) is an exceptional individual...top pilot, great fisherman, and wonderful host that has one thing in mind...making every one of his guests feel comfortable and much appreciated...and making sure that you have the time of your life!! 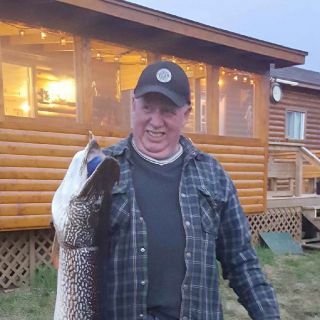 The camp atmosphere is warm and homey...great meals and great conversations about the days catches around the dinner table and on the screened patio in the evenings. 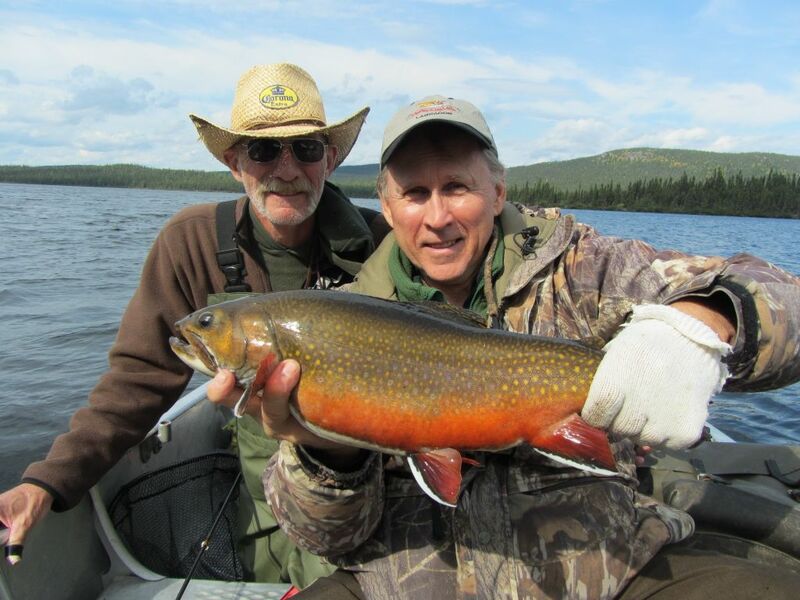 If you're looking for good fishing, good company, and a lodge with a home style feel and surrounding, this is the place to go! 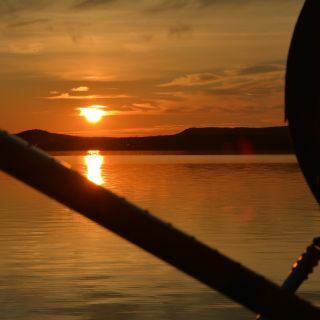 I'll be back with my family and friends for many years to come. 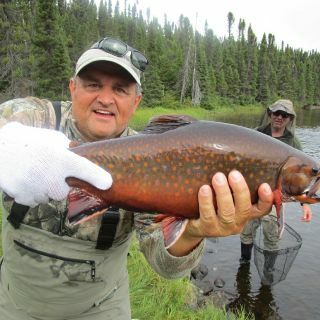 I've chased Brookies for many years, starting in New England and moving to Canada. 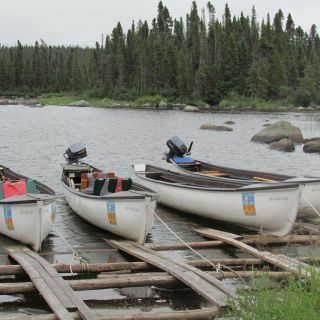 Every year I would try a new sporting camp till I found the one. 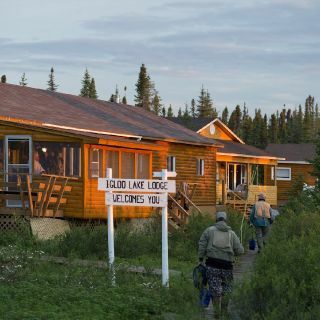 Well my trip this summer will be trip #8 to Igloo. 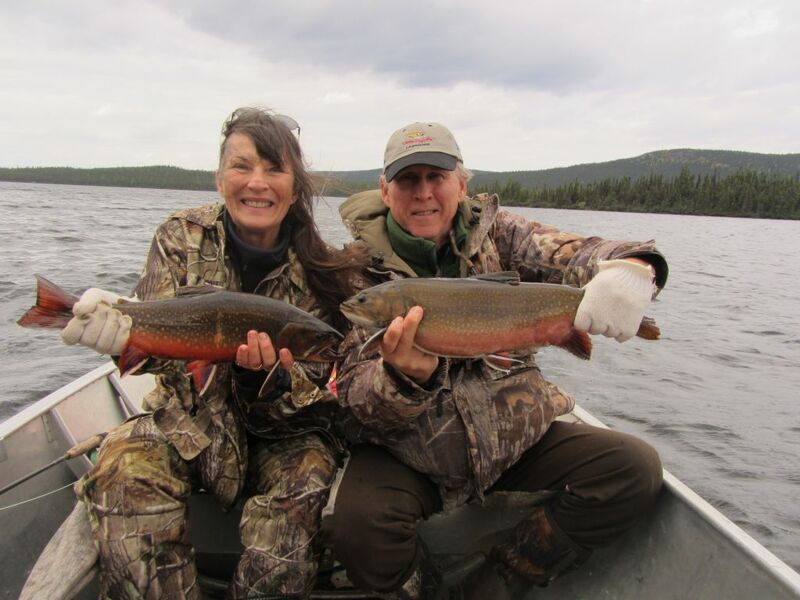 The Burtons have it all !! 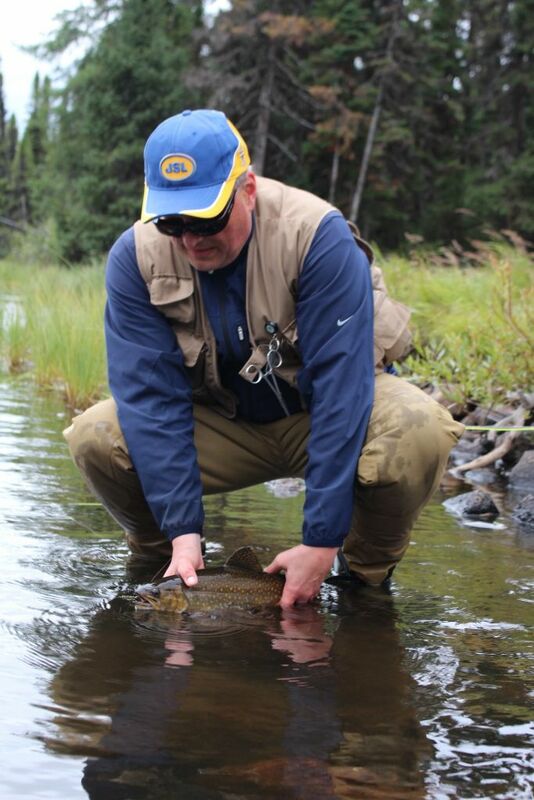 The lodge and equipment are second to none. 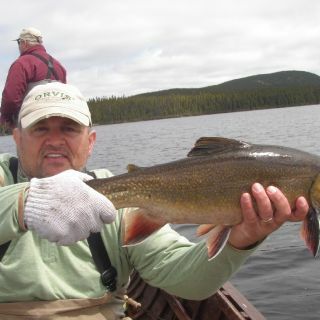 The fishing is fantastic with plenty of big fish. 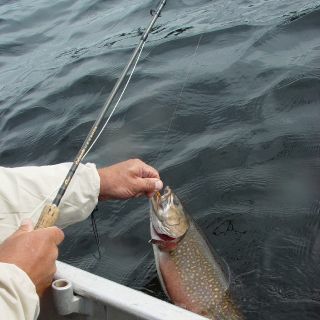 Throwing a dry to a cruising 7 or 8lb Brookie is as good as it gets for me. 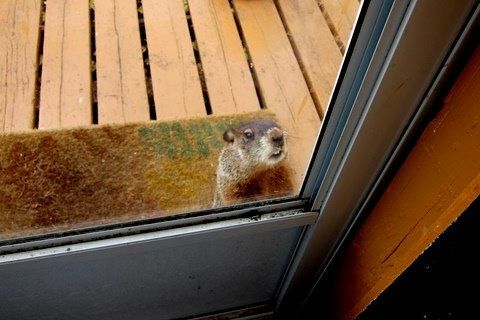 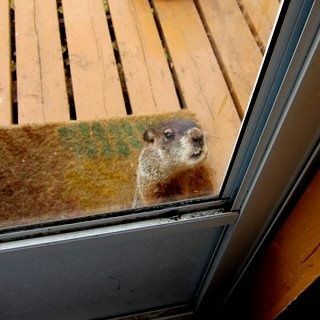 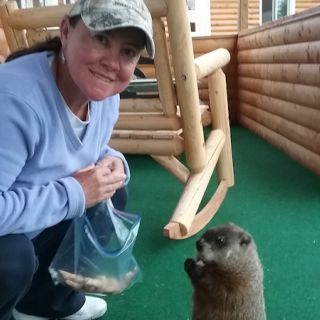 The ride in with Jim's Beaver is a treat in it self. 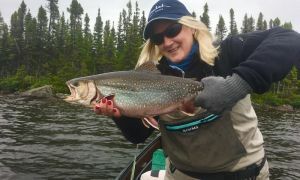 I would highly recommend Igloo to anyone chasing that dream Brookie!! 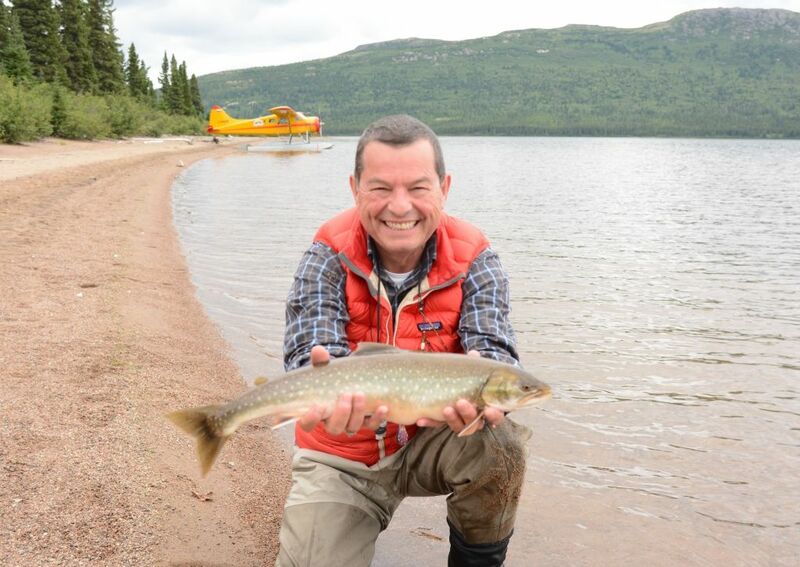 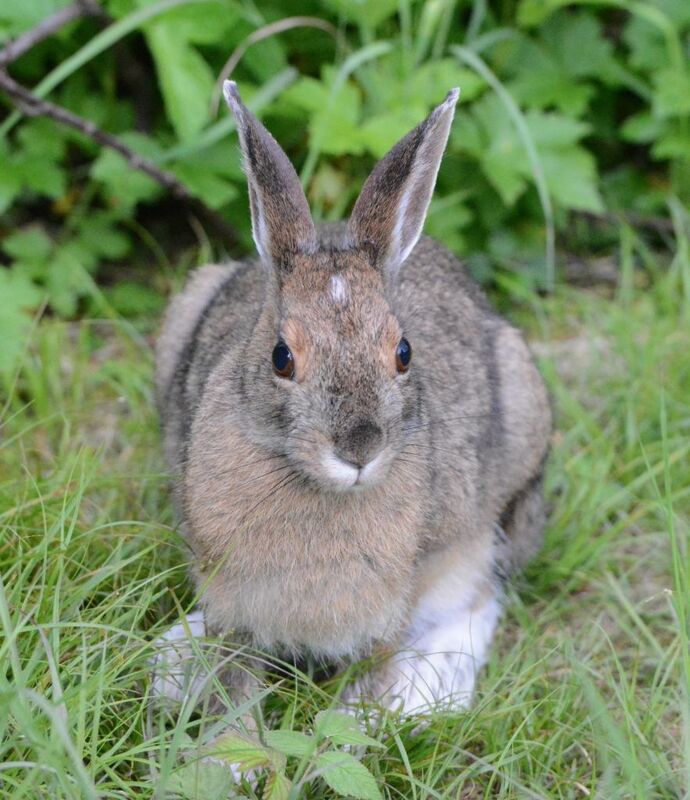 Labrador is a very special place...wild, beautiful, bountiful and exhilarating. 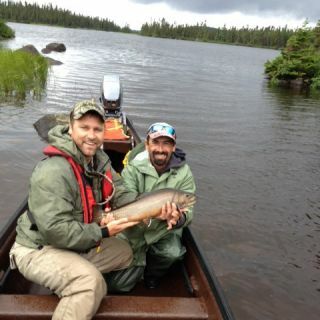 To experience all this in the company of the Burton family and their world class staff makes it all the more enjoyable! 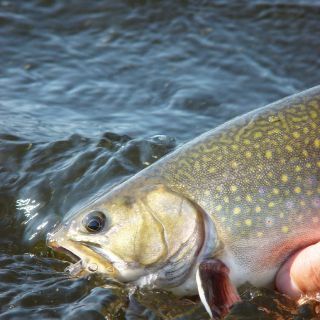 Passionate fly fishers have the opportunity to catch a fish of a lifetime on dries, streamers, mice...practically any trout fly pattern you can dream up while at your vice. 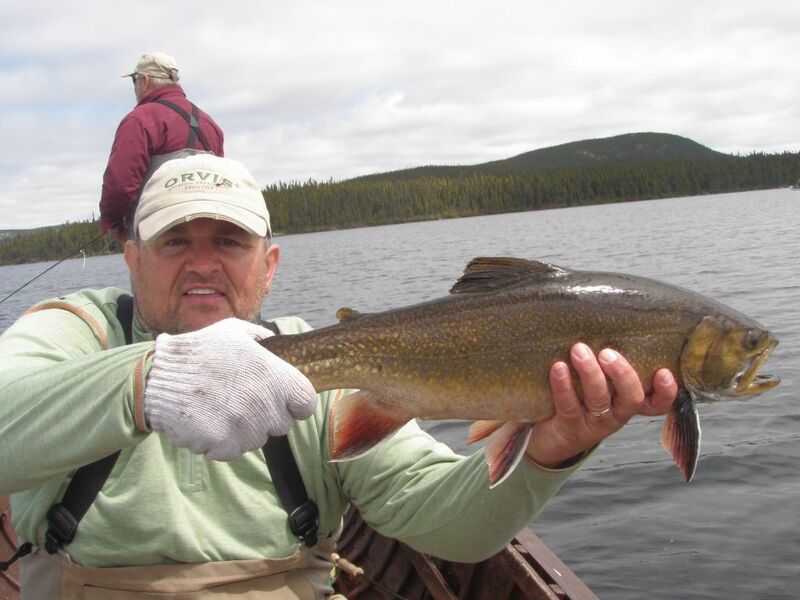 Beginners can feel like seasoned fishers as the abundance of trout makes it easy for all to have success. 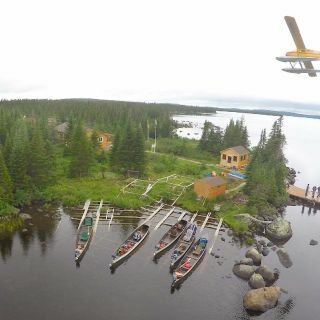 The flight in to the lodge on a beautiful DeHavilin Beaver owned and flown by Mr.Burton himself is just spectacular. 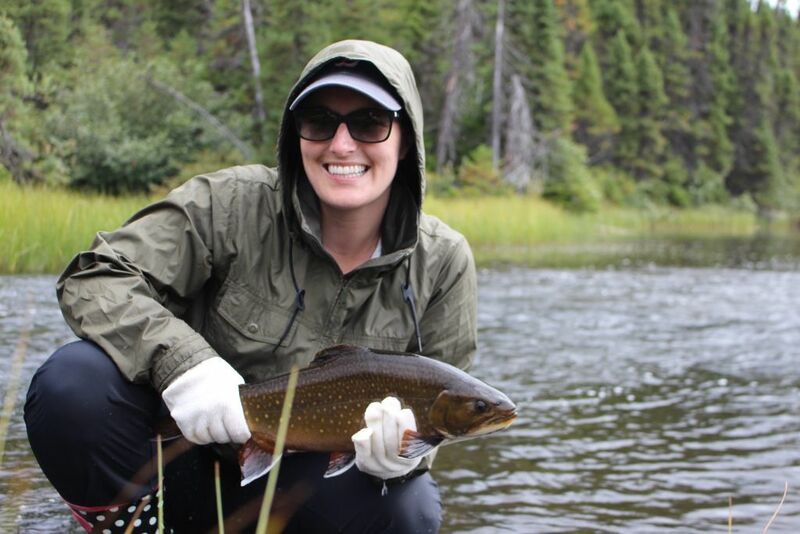 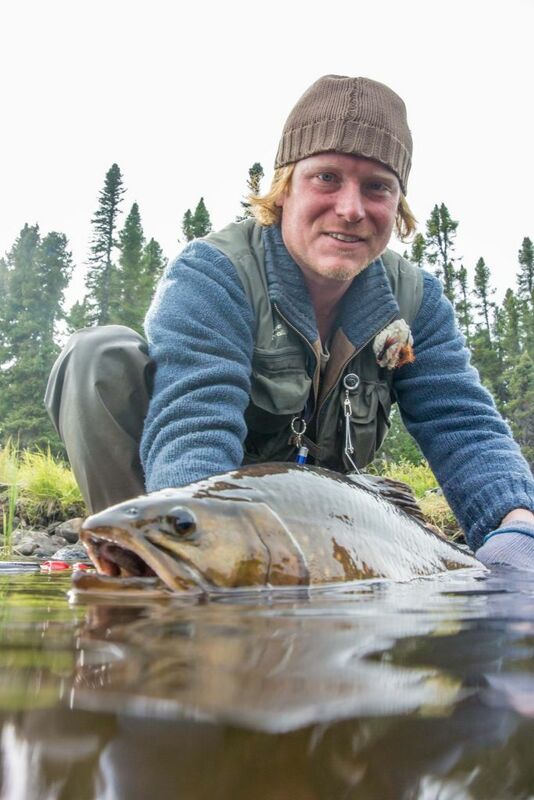 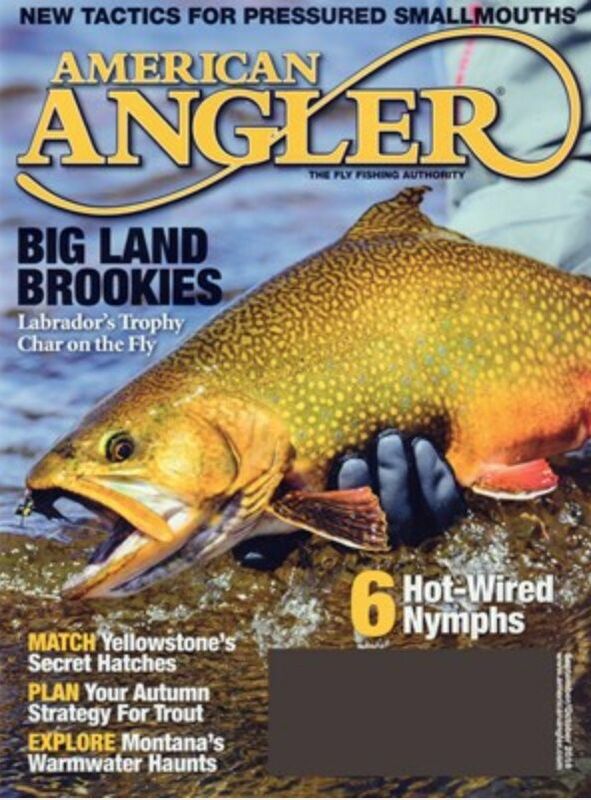 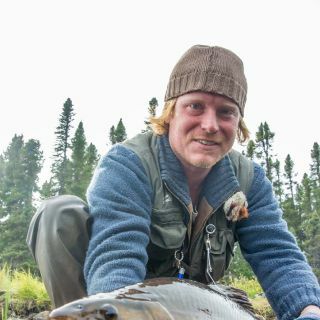 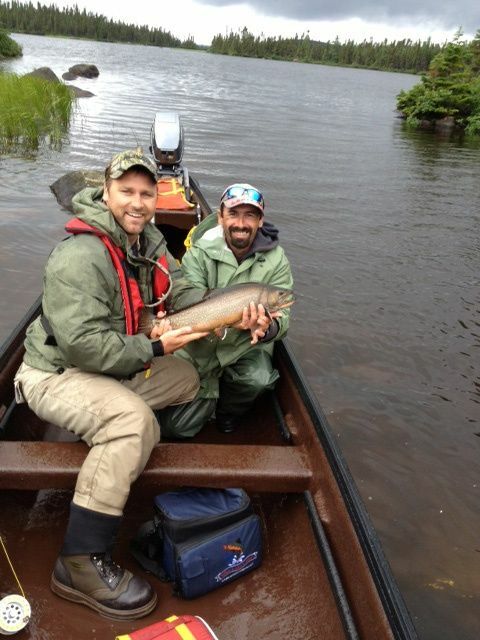 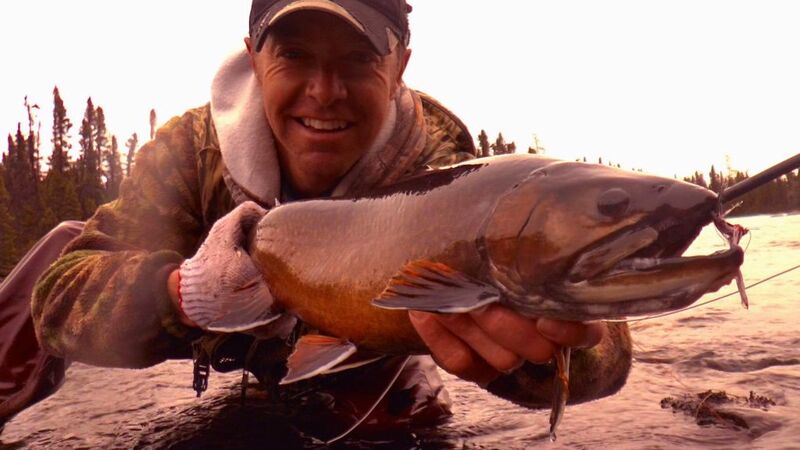 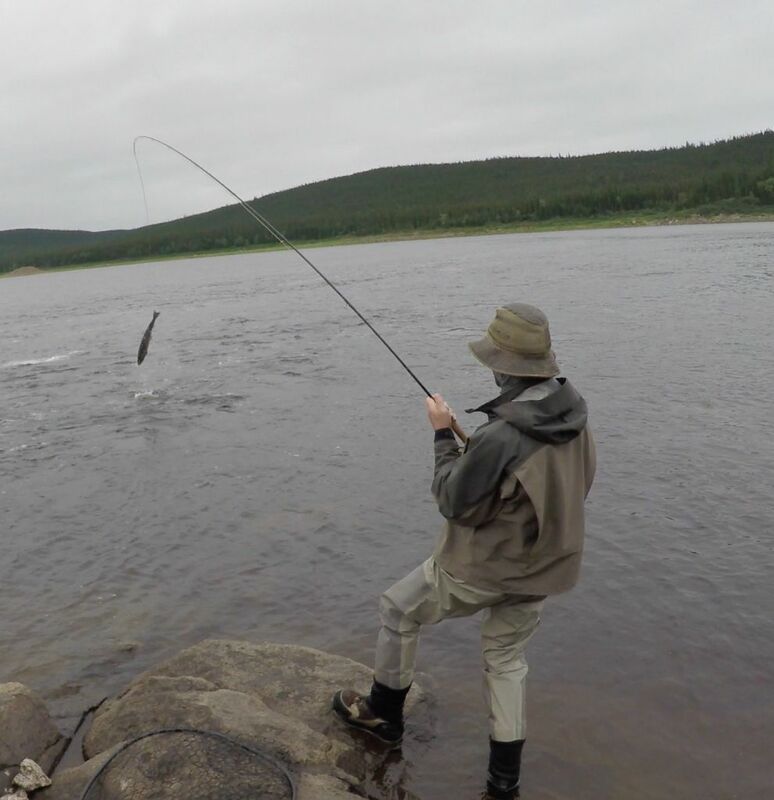 If you can, make sure to take advantage of the available fly out add on fisheries to the world famous Eagle River for the King of Sportfish, the Atlantic Salmon or to breathtaking Char Lake for one of the most desirable fish on the fly, the Arctic Char. 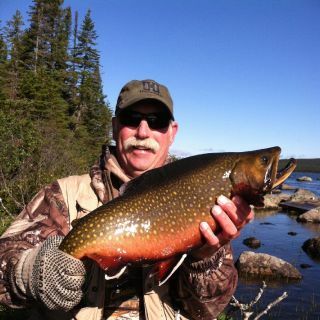 If you love fly fishing and want the fish of a lifetime...get to Igloo Lake.